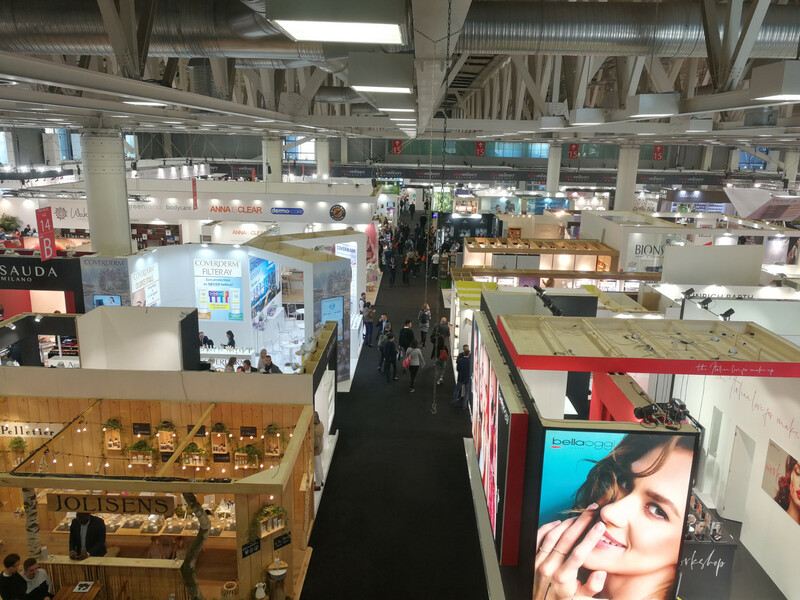 I saw many brands at the trade show that had exhibited the previous year(s) and therefore appeared in my 2017 and 2018 show reviews. So this article will focus on new brands – first-time exhibitors, recently launched brands and companies that I haven’t yet written about. Gotta keep things interesting! I’ve loosely grouped the brands by trend/product category, but other than that the of brands is completely arbitrary. Extraordinary Gallery which first appeared at the initial Cosmoprime in 2017. 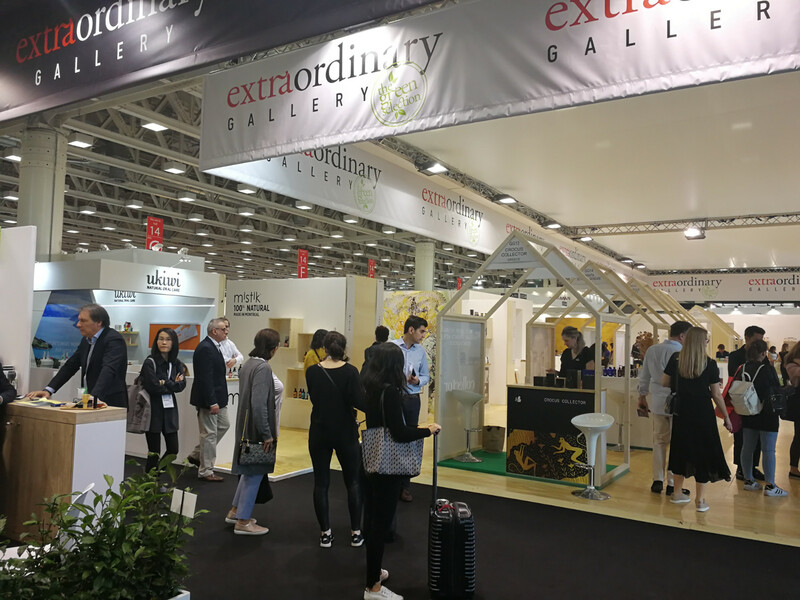 The following year Extraordinary Gallery was divided into two sections: the “normal” Extraordinary Gallery and Extraordinary Gallery Green, for natural/organic brands. 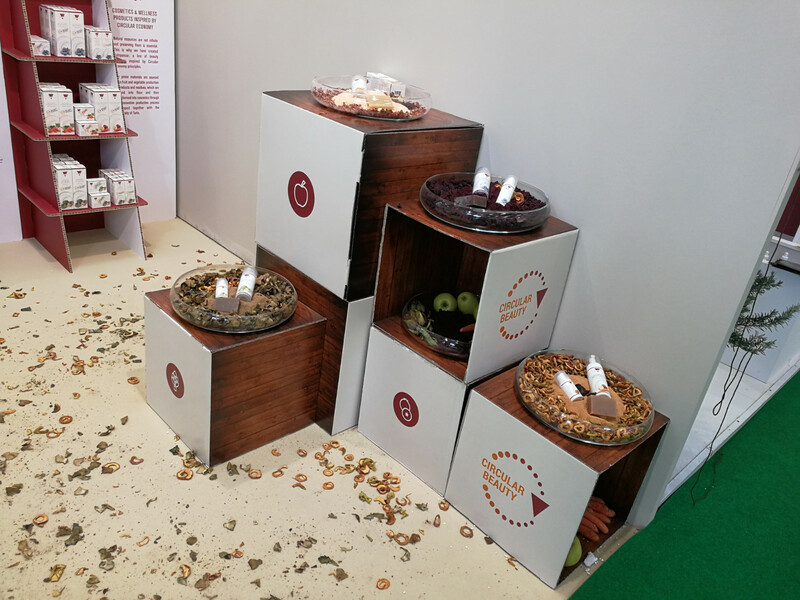 In 2018 the organisers also added a further showcase, Green Prime (for green and organic niche/luxury brands). And in 2019 Emerging Prime joined the club, a new section focusing on green and sustainable start-up brands. 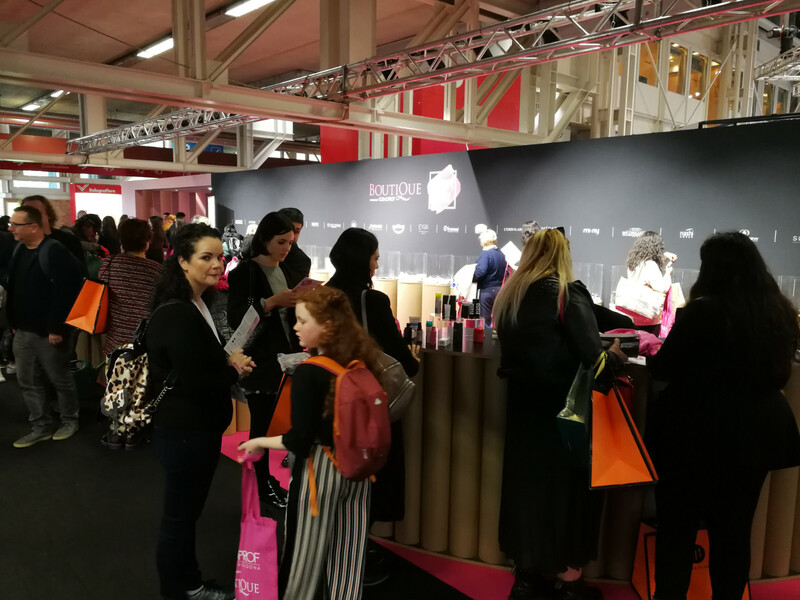 Cosmoprime is my favourite part of Cosmoprof Bologna – all of the beauty trends and exciting niche brands you could possibly wish for under one roof! 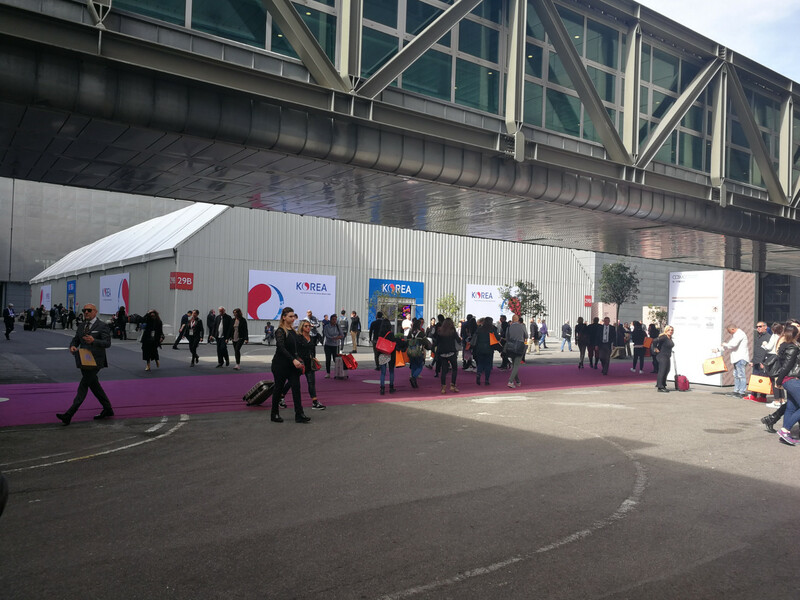 As you enter the hall (there’s a special ticket control; the normal trade show tickets don’t allow you access to Cosmoprime) there were around 65 regular exhibitors – mostly large companies and well-established brands, such as Markwins Beauty Brands, Straub Beauty Group, Gosh Cosmetics, Vivona Brands and so on. 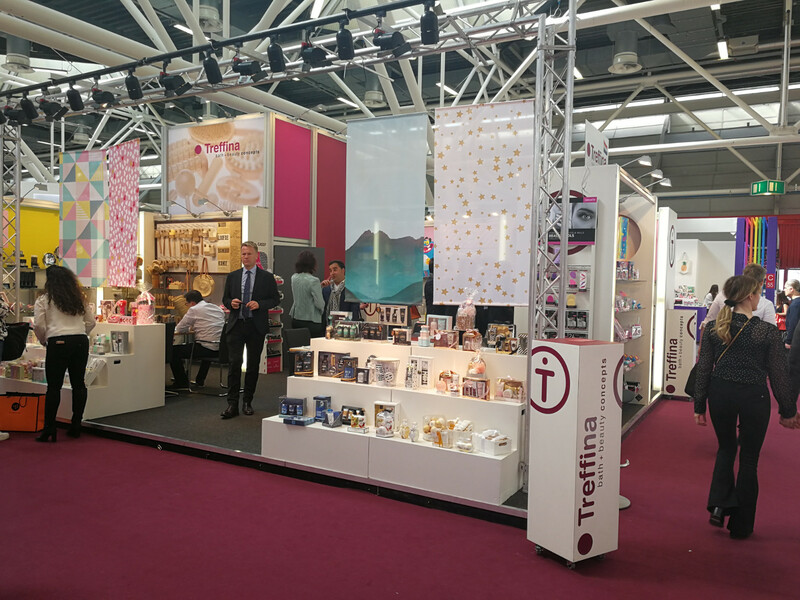 Continue walking straight ahead and you’ll reach Green Prime with around 60 exhibitors and, walking through this section you reach Emerging Prime (around 16 exhibitors). Further towards the back of the hall is the Extraordinary Gallery with some 54 exhibitors and if you veer towards the left you reach Extraordinary Gallery Green, a section with 18 brands. 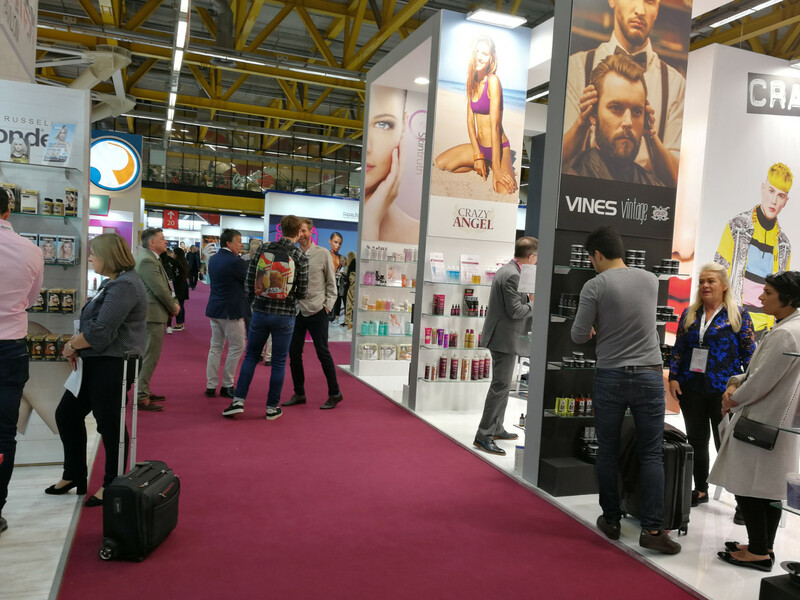 Men’s grooming (with the sub-category of shaving/beard care developing particularly rapidly) is still a growth market and many of the men’s beauty brands that I featured in last year’s review – like 66°30, and Zew for Men – returned to Cosmoprof Bologna this year. But there were also new companies, like Bulk Homme from Japan. 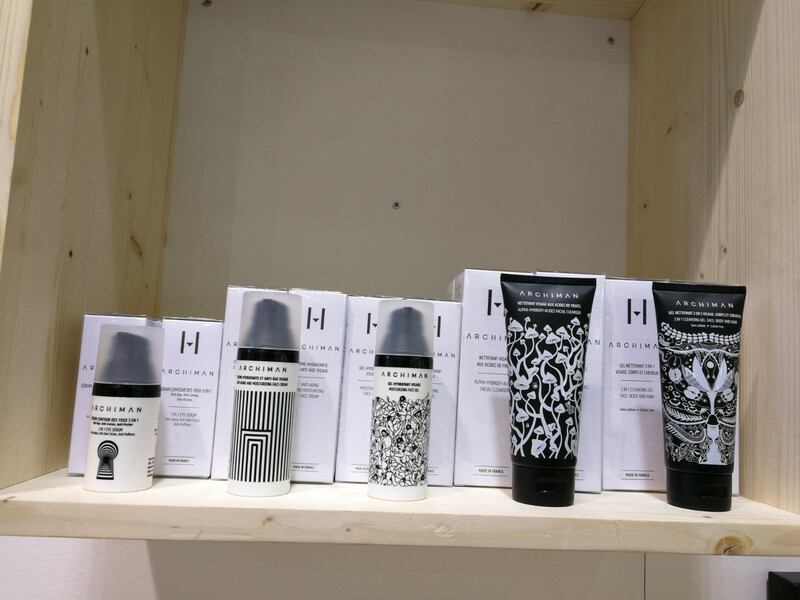 I first met Bulk Homme at Cosmoprof Asia 2017 and liked their minimalistic, stylish men’s care products. 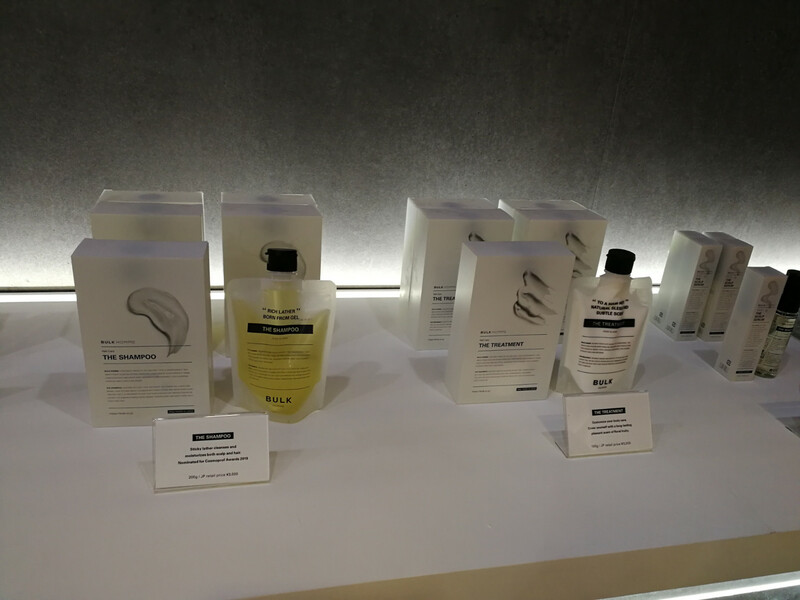 Over the past year the brand has relaunched its packaging and added several new products to the range, including a shampoo, hair treatment and scalp serum. The Shampoo actually won this year’s Cosmoprof Award. I was told that the company is now exploring the international markets – distribution in the US will start this summer and then Bulk Homme is planning to focus on the European countries, especially the UK, Germany and France. 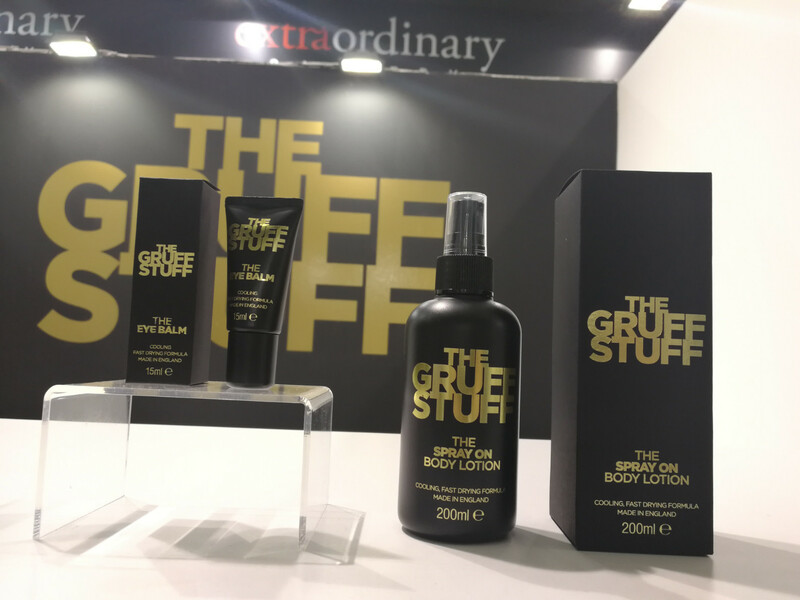 The Gruff Stuff is a clean beauty men’s care brand from the UK and was launched on the occasion of Cosmoprof Bologna 2019. The three products in the range – a Spray-On Moisturiser, Spray-On Body Lotion and Eye Balm – are certified vegan and the textures are really cool: the two moisturisers are clear liquids that you spray onto the skin; they dry immediately and leave a really nice silky feel behind. The Eye Balm is neither too rich nor too thin – I am very picky where textures are concerned, especially with eye care products, and the Gruff Stuff eye balm is a glossy gel cream which feels great on the skin. I also like the fact that the products are based on aloe vera juice rather than water (also, the key active ingredient is kakadu plum extract) and the packaging is ultra stylish, with matte black cardboard combined with a certain flamboyant sparkle from the golden embossed lettering. 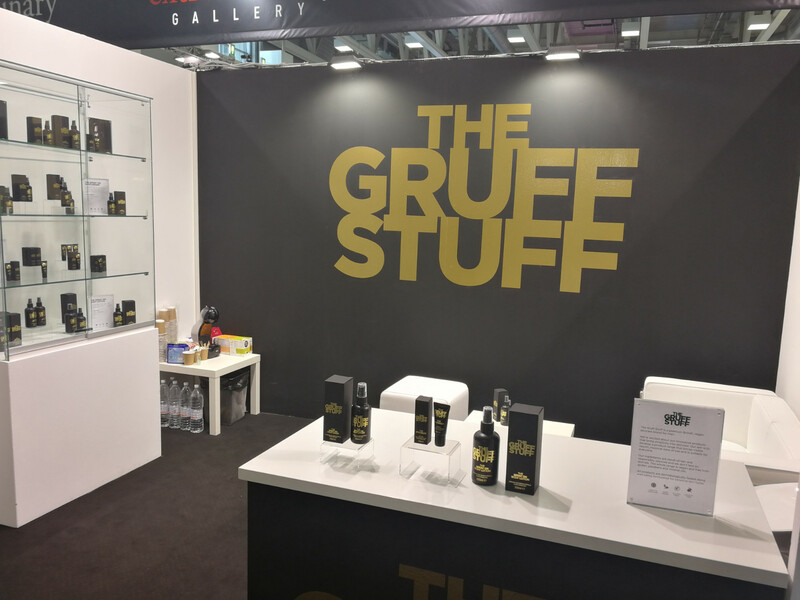 The two lovely Gruff Stuff founders told me that their brand has already found some stockists in the UK – the products will be available selected offline men’s grooming stores and online. 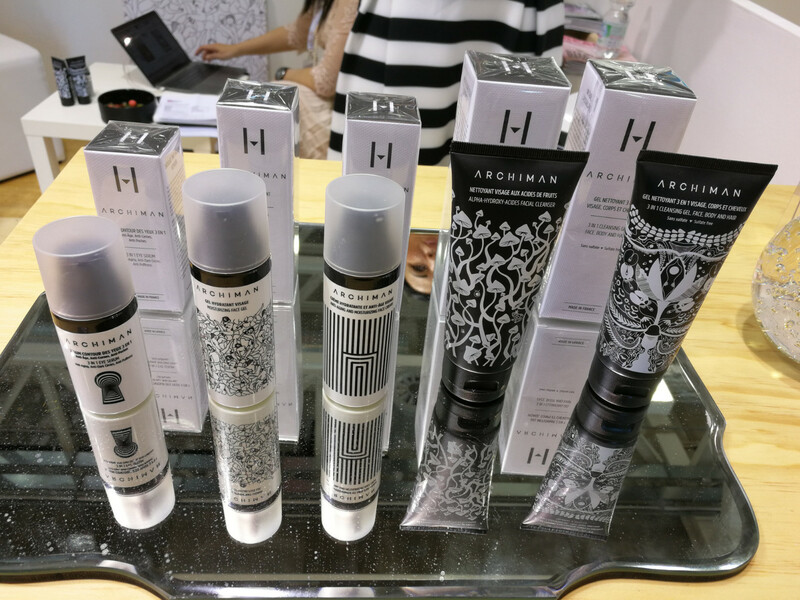 And here’s another men’s niche beauty brand with gorgeous packaging: Archiman is from France and their 5-sku range was launched in 2018. Products are based on seaweed extract and the intricate black-and-white patterns on the packaging are beautiful – every product looks different. The range has a distinct unisex vibe which I like. Archiman’s products are sold in selected Parisian department stores and a number of pharmacies. 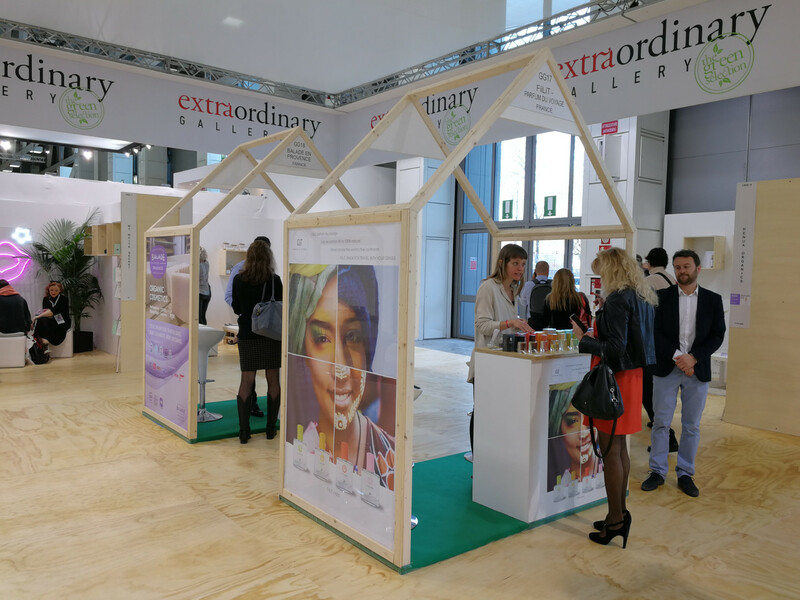 Cosmoprof Bologna also featured several exhibitors with interesting sustainable and zero waste brand approaches. One of these exhibitors was UpCircle Beauty in the Extraordinary Gallery Green section. The young brand from London offers nine bath and body care products that are formulated with reclaimed/repurposed coffee grounds. And this is how it works: UpCircle collects old/used coffee grounds from cafés and restaurants. These grounds are then cleaned and used as a key ingredient in the brand’s body scrubs and face scrubs, which are available in three different essential oil-based fragrances for different skin types. 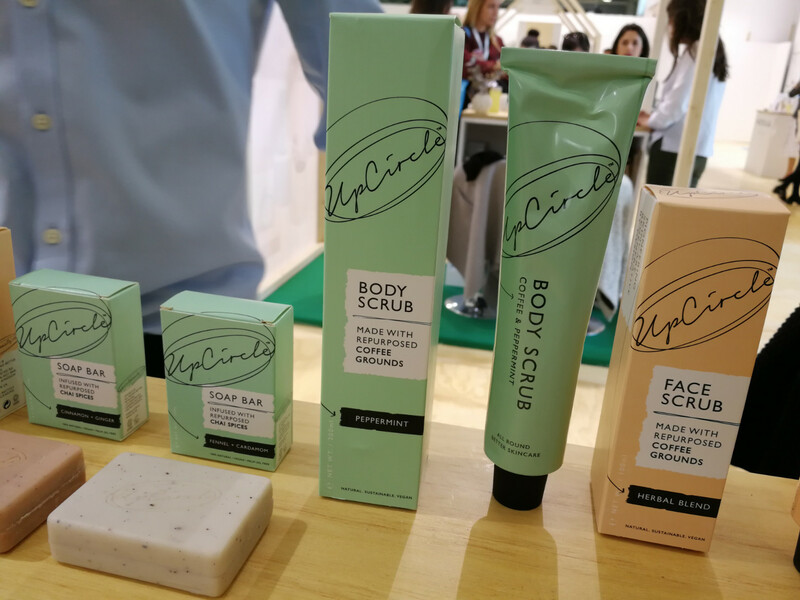 UpCircle’s line-up also includes two bar soap that are formulated with ground chai tea leaves (which are collected from a company that produces chai tea syrup) and there’s also a face oil serum which contains coffee oil manufactured from repurposed coffee grounds. Some of the products are Cosmos certified but I was told that it’s the coffee grounds that make certification a bit tricky – the grounds are collected from different businesses, some of these which are organic but others aren’t. Or a café might use different types of organic and non-organic coffee bean variants. In its domestic market, UpCircle’s products are retailed in independent health food stores and pharmacies as well as online. The range was also launched in some 280 Boots drugstores across the UK recently. 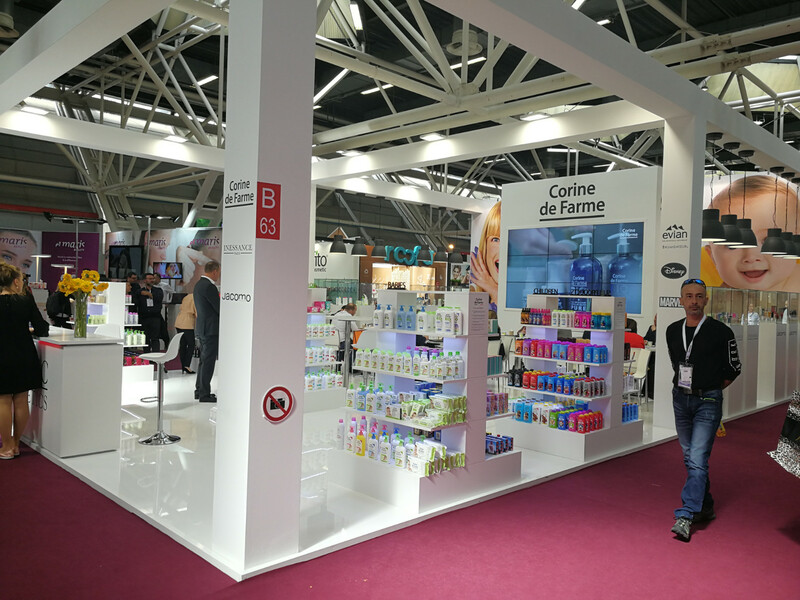 Organic French beauty brand Nutryancor was an exhibitor in Hall 21N (the “Green Hall”). 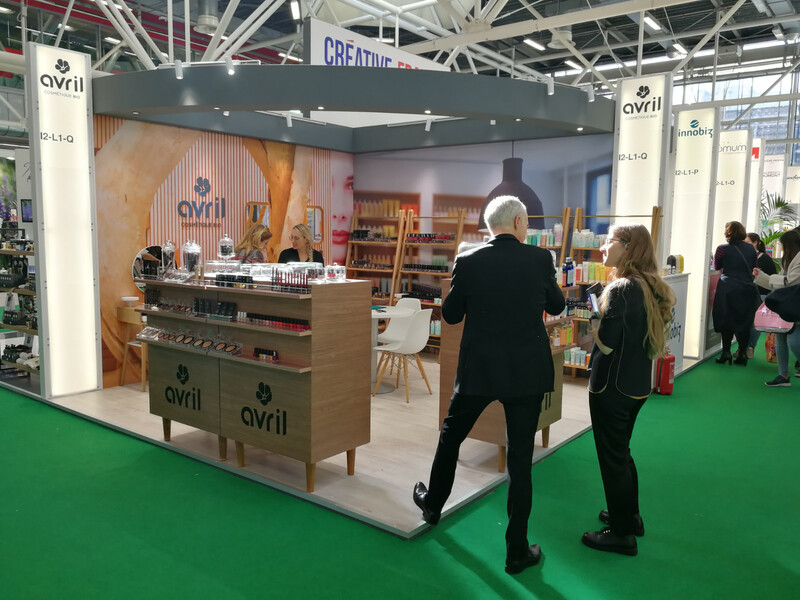 The company has a great brand concept which is ticks all the right boxes: hard-core Circular Economy as well as vegan, certified organic, local and zero waste. Nutryancor was launched in 2016 by Italian C&T manufacturer Carone in cooperation with the University of Turin (Torino) in the Piemont region of Italy. 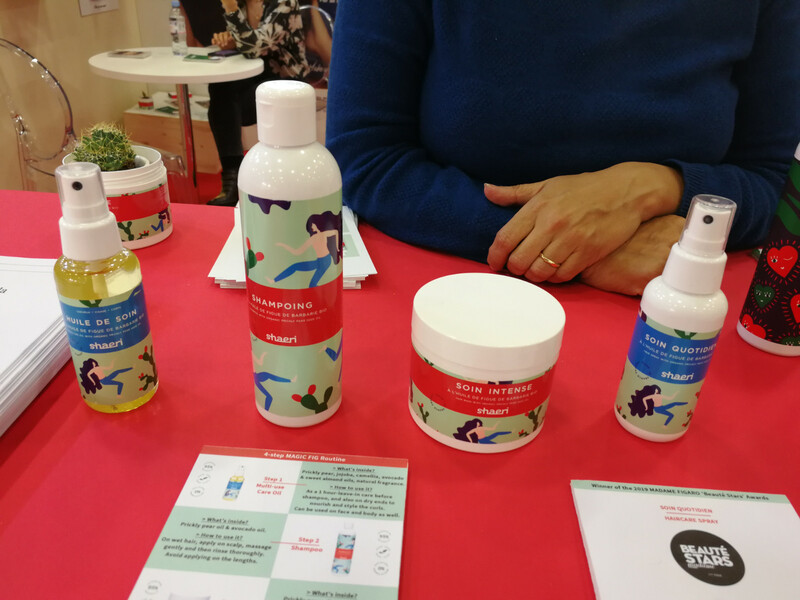 The brand offfers 11 sku of face and body care which are manufactured with organic food waste – fruit and vegetable peels – which is sourced from two local AIAB certified organic farms. The university’s Chemistry & Agrarian Sciences department developed a special process to turn this food waste into a cosmetic ingredient: the fruit and vegetable peels are collected, dried and ground to a super fine powder which is then used in the formulations of Nutryancor’s four product ranges: Apple (which offers a moisturiser and cream), Carrot (comprises three sku: bar soap, cleanser and moisturiser), Artichoke (three products, a bar soap, serum and scrub) and Blueberry (this range includes a bar soap, leg gel and face cream). I was told that the inspiration behind Nutryancor was to find a way to use up food waste rather than creating yet another beauty brand. The founder also wanted to establish a truly sustainable business, with a local production chain and distribution. 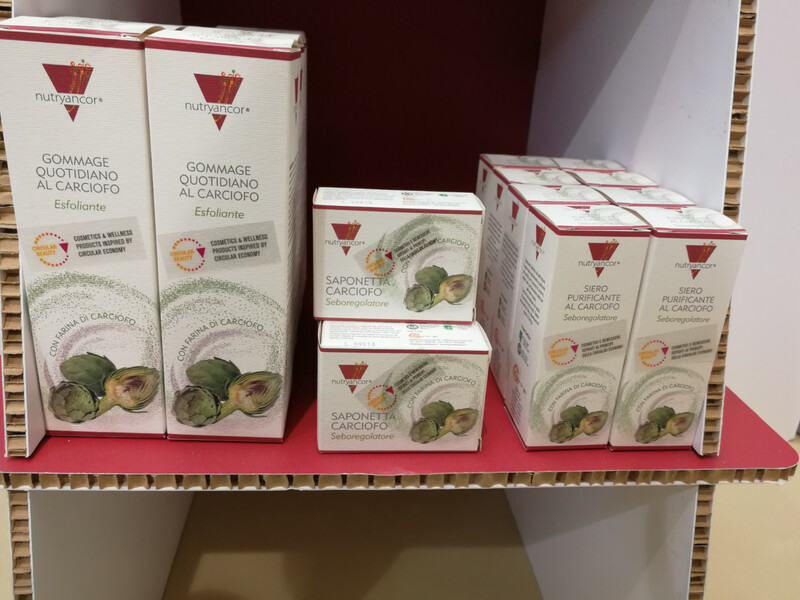 And I’d say he managed to do that pretty well: the Nutryancor products are manufactured in Torino and although the company also operates a webshop, their offline retail is also Torino-based: you can find the Nutryancor products in selected independent health food stores in the city. 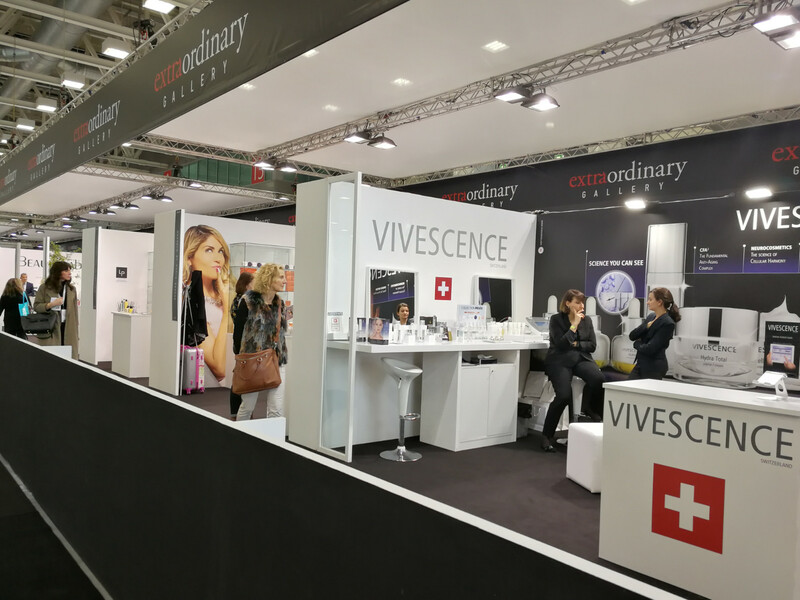 In my trade show reports I like to stick beauty brands from these two categories – beauty tech (also called beautytronics; i.e. digital/electronic beauty gadgets) and inner beauty (nutritional supplements, health drinks and so on) – into the same section. It’s such a great contrast. In Asia, inner beauty and beauty tech are two major product categories – Japan, for example, has the most differentiated (and largest) supplements market in the world and many Japanese skin care brands habitually launch supplements, beauty drinks and so on as part of their anti-ageing face care ranges. In Europe – not so much, or at least, not yet. 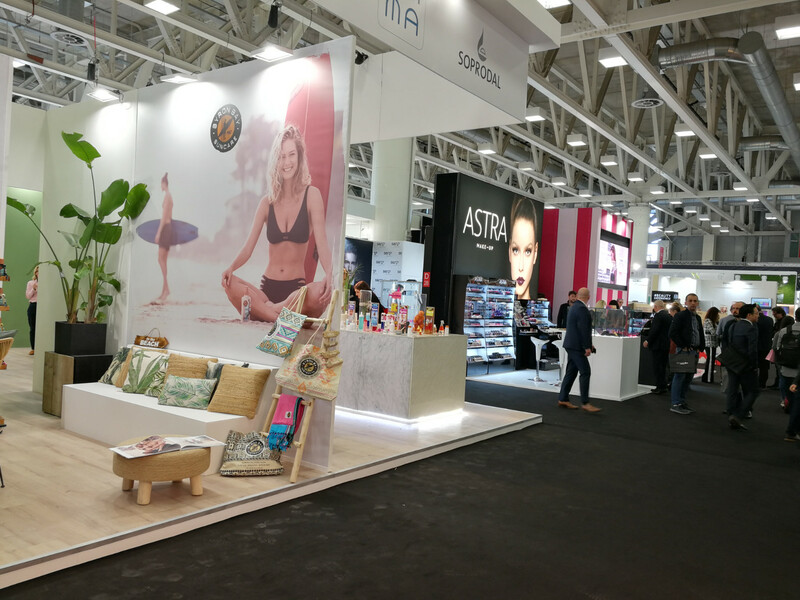 I did notice a few interesting European nutritional supplements manufacturers at Cosmoprof and one of them was Beauty Pearl from the Netherlands. 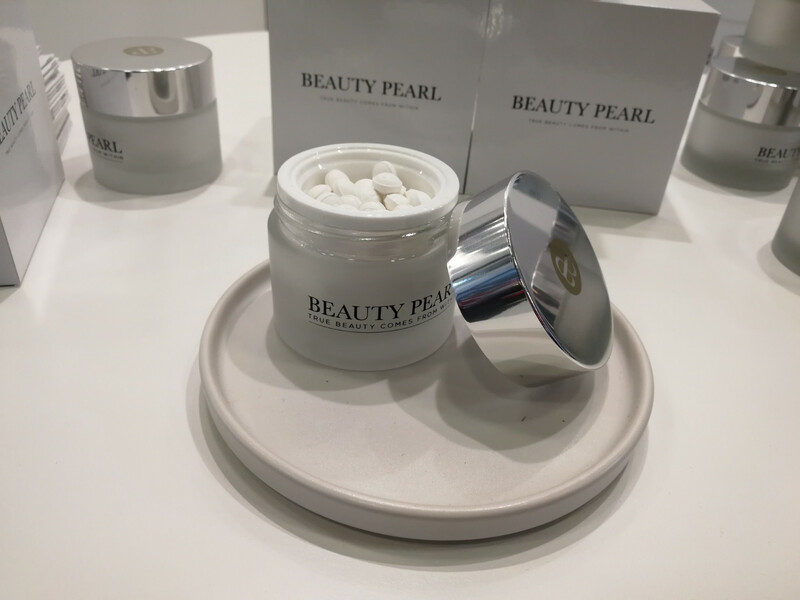 Nutriceutical brand Beauty Pearl was launched in December 2018 and a jar of Beauty Pearl supplements is priced at a jaw-dropping 189 Euro for 60 “pearls” (round tablets) which will last you for around a month if you take the recommended dosage of two pearls per day. 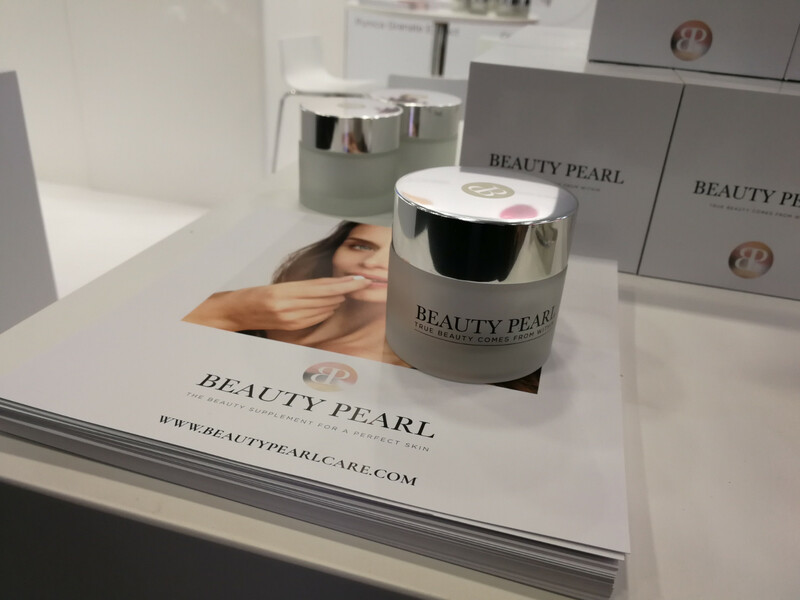 Beauty Pearl is described as “The Beauty Supplement for a Perfect Skin” and claims to boost health and general well-being (thus improving skin health, texture and radiance) by providing a unique blend of nutrients, minerals and other active ingredients. The tablets are formulated with 16 different complexes and substances, including the patented Ceramoside ceramide complex,ubiquinone co-enzyme Q10, SOD B Extramel Super Oxide Dismutase, concentrated aloe vera gel powder, a curcumin complex, low molecular weight hyaluronic acid, Vitamin K2-MK7K2 Vital Delta complex, pomegranate and apple extracts, vitamins A and E, bamboo extract, copper and biotine. Plus a few other complexes and blends, such as Pycnogenol extract obtained from the French Maritime Pine. The packaging looks very high end indeed (as you would expect, considering the price point!) and the pearls are vegan, gluten-free and sugar-free, formulated without additives, colourants and allergens (the brochure doesn’t go into detail about WHICH allergens these might be). This is very much a luxury product and so are its retail channels: high-end perfumeries, luxury department stores, selected spas and salons and online. From inside beauty to the outside: meet Shot Mode from Japan. This at-home microneedle skin care treatment is a dissolving microneedle patch (a type of transdermal delivery system – medical technologies are one of Shot Mode’s manufacturer Nissha core business segments) which you apply to your skin. The patches look a little like hydrogel mask patches (but the material is firmer and more plasticky) and are impregnated with tiny serum needles. These serum spikes penetrate the very top layer of the skin and then dissolve – it’s a microneeling treatment effect but without actual injury to the skin. Shot Mode is available in three variants: GF3 is for the fine lines around the eyes and frown lines (this one is shaped like a classic undereye mask patch and the serum contains ceramide, high molecular hyaluronic acid and EGF/FGF growth factors). BT-X was developed to treat nose pores and the wrinkles that develop between the brows (shaped like a nose strip, contains Argireline, hyluronic acid and EGF/FGF) and C6 are small and circular patches formulated with 6% vitamin C and hyaluronic acid for acne scars, spots and freckles. 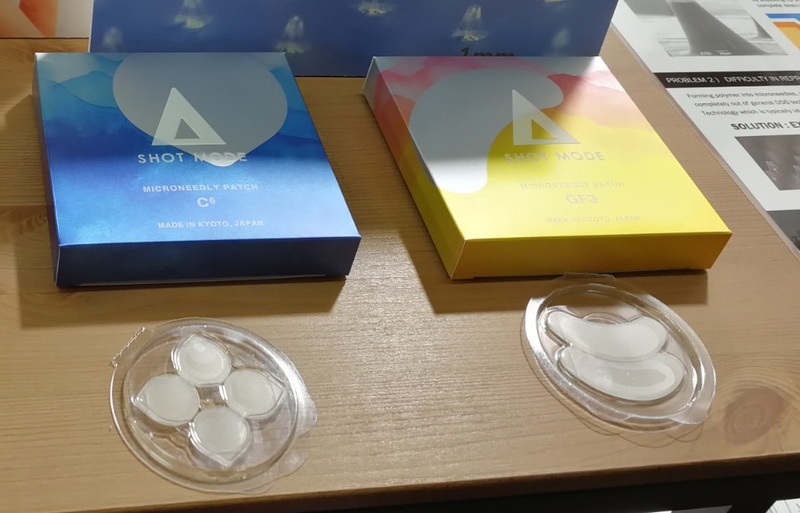 The manufacturer recommends adding the Shot Mode patches as a special treatment to your skin care routine (recommended usage is once or twice a week) and I was told that the brand will soon be distributed in the EU markets. I wonder if the brand will also exhibit at Beauty Düsseldorf salon trade show next week? And Geoskincare is a beauty tech brand from New Zealand. 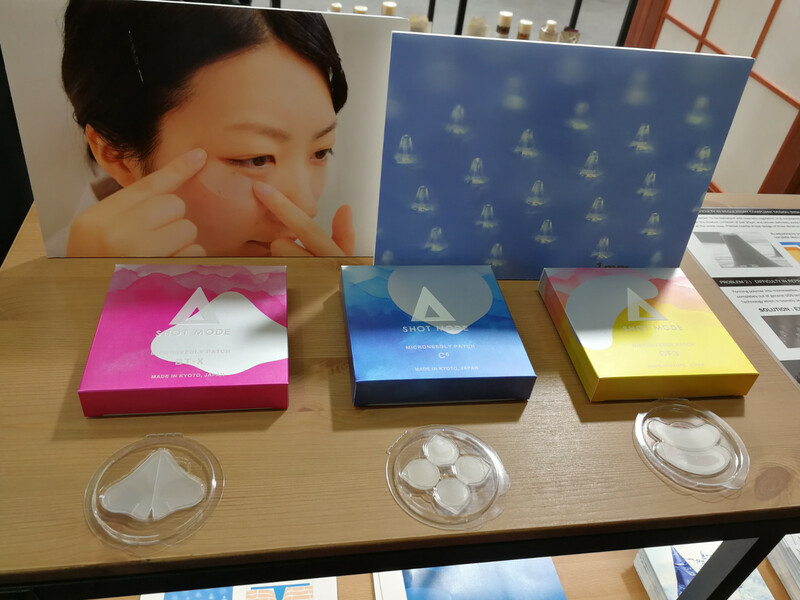 Founded by entrepreneur Aaron Liu in 2000, the at-home skin care tool is sold in around ten international markets and is particularly popular in mainland China, where the brand is distributed in more than 120 Watsons drugstores and also operates around 50 own brand stores. 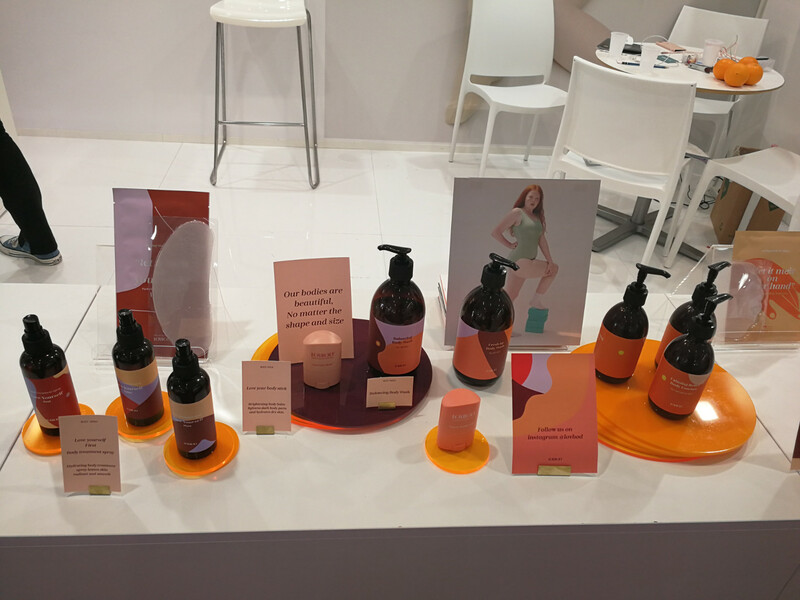 Geoskincare also manufactures a range of natural skin care products formulated with typical NZ ingredients but the brand’s star product is definitely the skin care device. 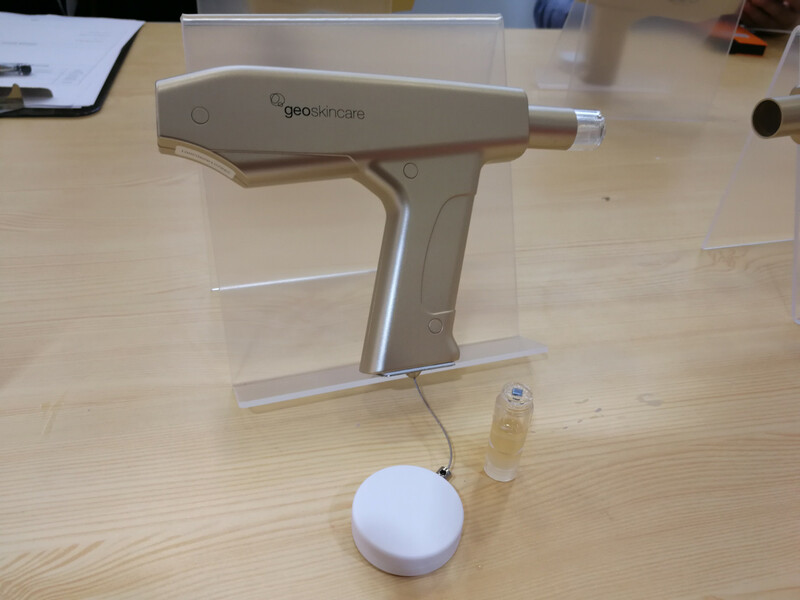 As you can see in the picture the tool is pistol-shaped and “loaded” with serum cartridges. 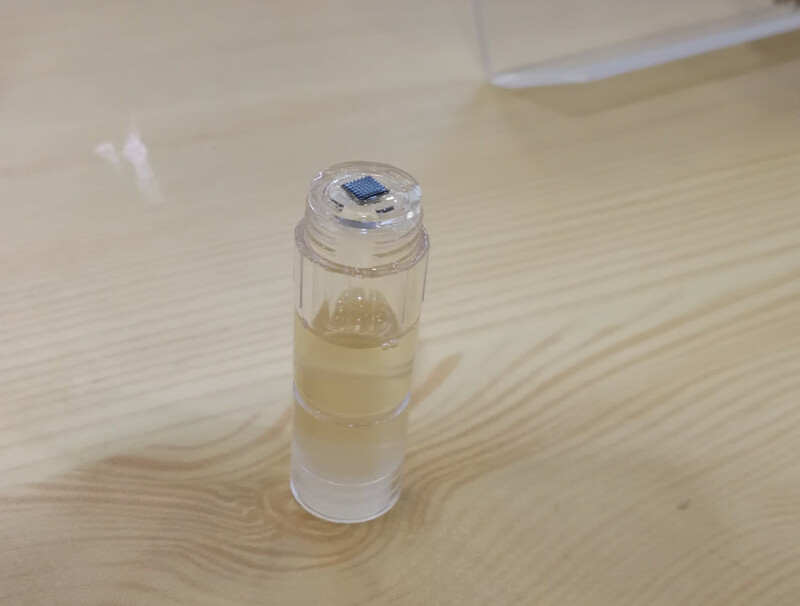 The front of each serum cartridge features a small nano-chip (see pic) which vibrates against the skin once the device (which is charged via USB) is turned on, opening pores and thus allowing the serum to better penetrate the skin. 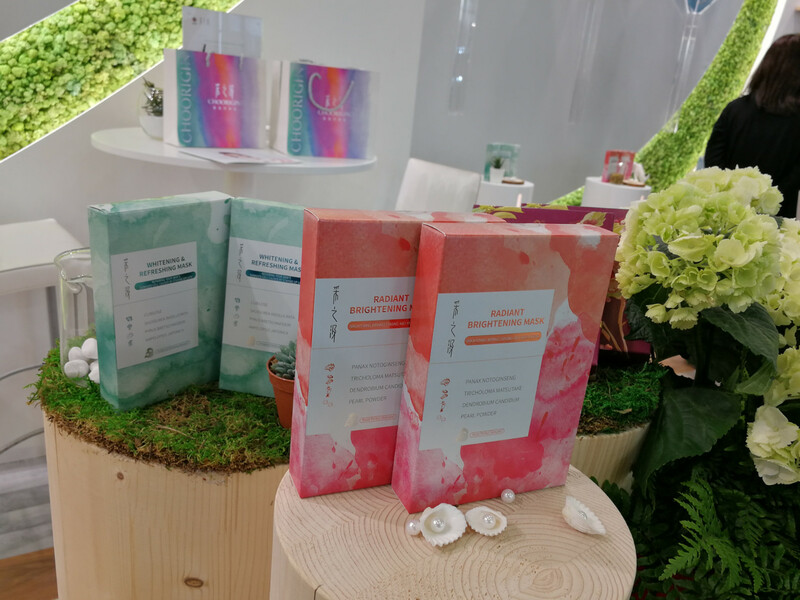 There are four serum variants (Anti-Ageing with peptides, Moisturizing with Hyaluronic Acid, Brightening and so on; each box contains 6 serum cartridges) which you can repurchase individually. There is also an attractively packaged gift set which features the device plus a pack of serum cartridges. 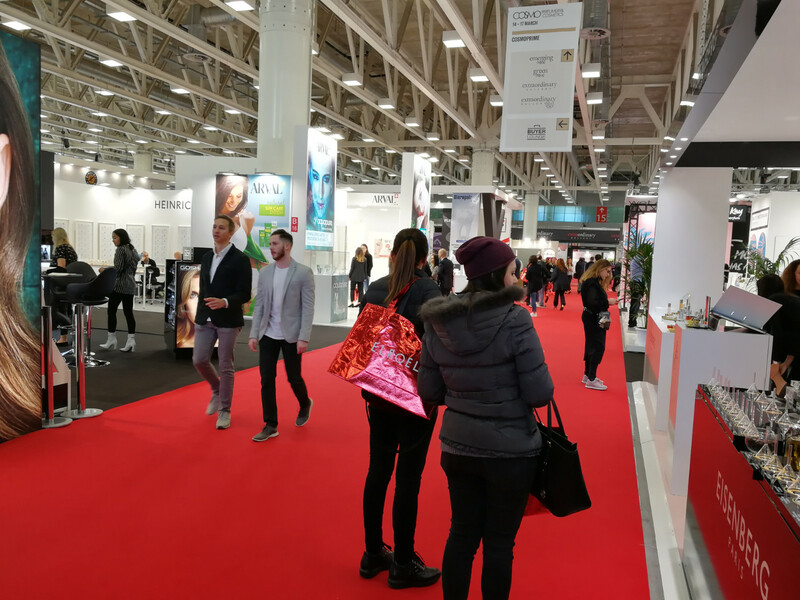 Trend research agency Beautystreams highlighted intimate/feminine skin care as one of THE key beauty trends at Cosmoprof Bologna 2019. This is definitely a category that is on the rise, and high time it did, too! A quick definition in case you’re confused: intimate/feminine skin care refers to cosmetic products – lotions, creams, deodorant sprays, washes but also lubricants – that are developed for a woman’s private area. Vaginal skin care, if you will. The category does NOT include feminine hygiene products such as tampons, pads, menstrual cups etc. 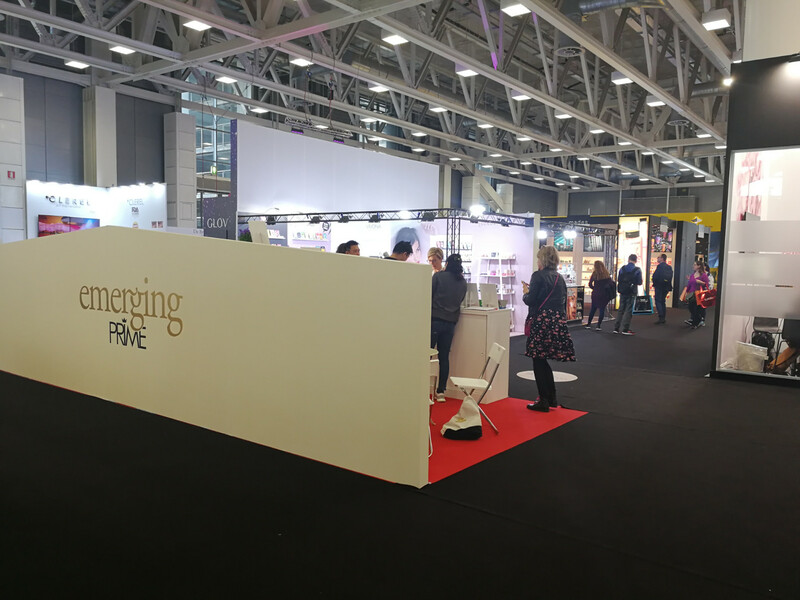 At the Asian trade shows I visited over the past year I noticed a number of intimate skin care brands – like Taiwanese brand TS6 at Cosmoprof Hong Kong 2018 or Japanese beauty brand Intime Organique at Cosmetokyo 2019. Still, so far I hadn’t seen any European product ranges (or maybe I simply didn’t pay the attention that this category deserves!). 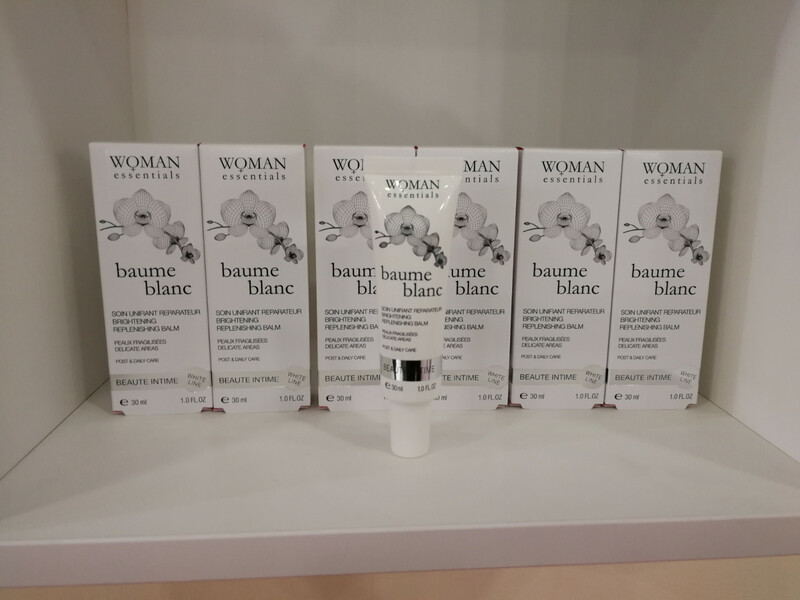 However, this has now changed forever because one of the Emerging Prime exhibitors was Woman Essentials from France. I’m including the brand in this category because, as founder Madina Karsybayeva said very correctly, intimate feminine hygiene products do not just have an aesthetic (i.e. cosmetic) effect on the skin but also significantly contribute to overall health and well-being. Madina launched Woman Essentials in 2012 which makes her brand one of the pioneers in this market. The brand’s line-up offers five skin care products plus a massage oil (or rather, an oil-based lubricant) and a moisturising lubricant. Soothing Conditioning BB Balm was formulated for daily care and sensitive skin and helps skin to heal faster. Particularly suitable for depilated areas and in-grown hairs but also for scars and post-pregnancy care. Brightening Replenishing Wash is a, well, wash to help strengthen the intimate flora, cleanse and soothe the skin. Bain de Soie was developed for sensitive and dry skin and is especially suitable to cleanse and regenerate the skin after post-natal surgery. Deodorising Care Mist is a small deodorant spray to freshen and moisturise dry, shaved and sensitive skin and Brightening Replenishing Balm – the brand’s newest product launch – addresses the problem of hyperpigmentation and discoloration, whitening, soothing and regenerating the skin. On the lubricants side there is the Deep Moisture Oil Lubricant (based on medical-grade silicone oils) which was developed for severe vaginal dryness (menopausal dryness, for example) and intensively hydrates the intimate tissues whilst stimulating collagen production. The product is available in two versions, a higly-concentrated vaginal treatment in 30ml and a more general massage oil (100ml). Finally there’s the Revitalizing Hyaluron Lubricant which has a fresher, more watery texture to restore intimate microflora and alleviate occcasional dryness. 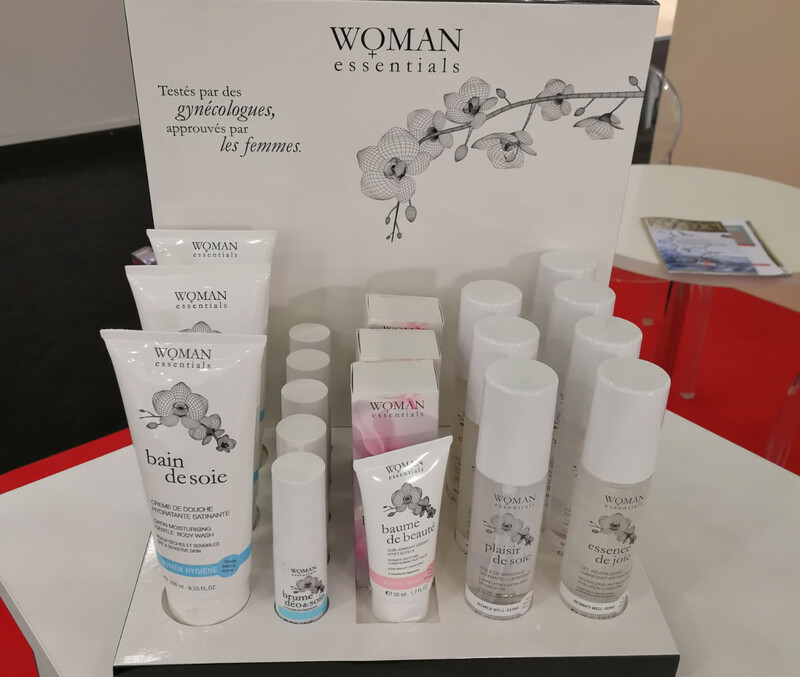 Woman Essentials is sold in ten countries worldwide; the Middle East and Japan are amongst the company’s key international markets. In Japan, Woman Essentials is retailed in Isetan department stores and the national bestseller is the Deo Spray) whilst Kuwait is amongst the the most important Middle Eastern markets – here the medical aspect of the brand is more important and products are primarily retailed in health clinics and hospitals. In France, on the other hand, pharmacies are a key retail channel for Woman Essentials. 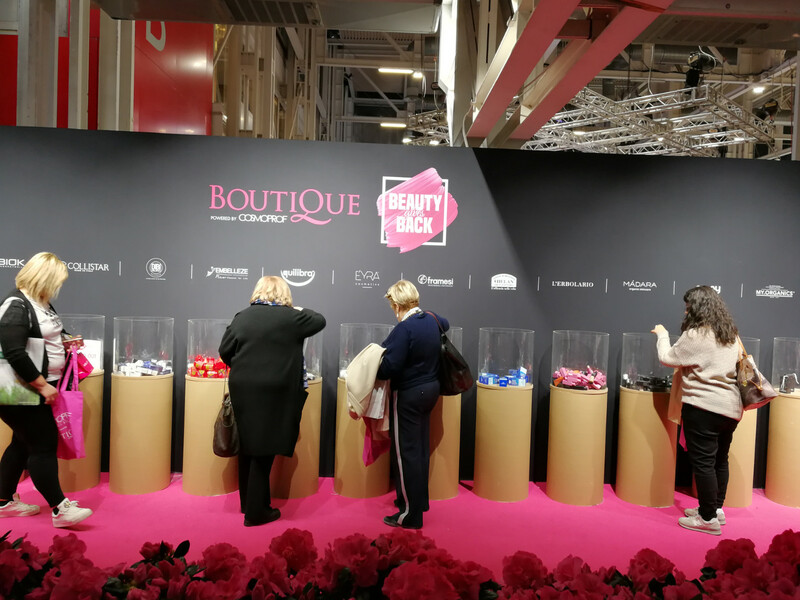 The products are paraben-free with pretty clean formulas and retail prices in Europe range from 15-25 Euro depending on the product. A really interesting brand! “Inclusive beauty” is another concept that’s trending strongly at the moment – and so it should, of cours; better late than never! As a Caucasian female living in Western Europe I’m lucky enough that around 98% of the beauty products available in my region (especially where makeup colours are concerned) are a perfect match for my skin tone and hair type. 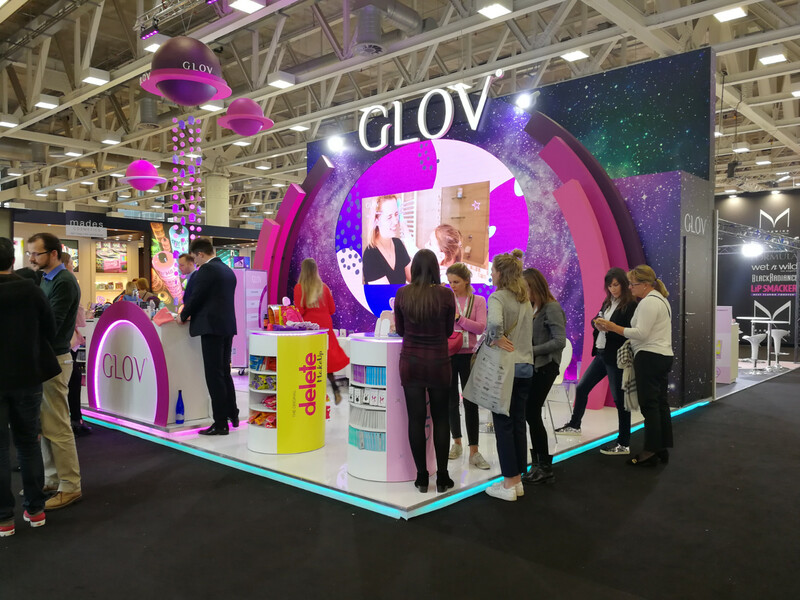 And Cosmoprime included some fabulous start-up brands from this category – meaning, beauty brands that offers products and/or shades that are suitable for a wider range of skin tones and hair types than you’d generally find in Western Europe. Shaeri, for example, is a French niche brand launched in summer 2018. Shaeri specialises in hair care products for very curly, textured or very dry hair types. All products are manufactured in France and are based on natural ingredients (and yes, the formulas really are pretty clean). The company’s Detox Aloe range, for example, offers a Scalp Scub and a CoWash (a term which stands for “Conditioner Wash”, refering to surfactant-free (or low-surfactant) hair cleansers. Frequently called NoPoo or LowPoo). The CoWash is a rich creamy hair cleanser which looks and feels more like a conditioner than a shampoo. It’s much more moisturising than your average surfactant-based shampoo which is why this type of product is ideal for hair with a thick, twisted structure or for very dry hair. My own hair is thin and straight (there’s a German term which describes it pretty well, “spaghetti curls”!) so CoWash is the absolute worst kind of hair product for me. However, if you have ringlets or textured/ethnic hair, wash creams keep hair much more hydrated than normal shampoo. The Shaeri range also includes a 4-sku range of hair products formulated with prickly pear oil (the line offers a silicone- and sulfate-free shampoo, a hair mask, a dry oil for hair and body and a leave-in conditioning spray) and two kids products (also for curly hair): I love the pack design which looks so striking! 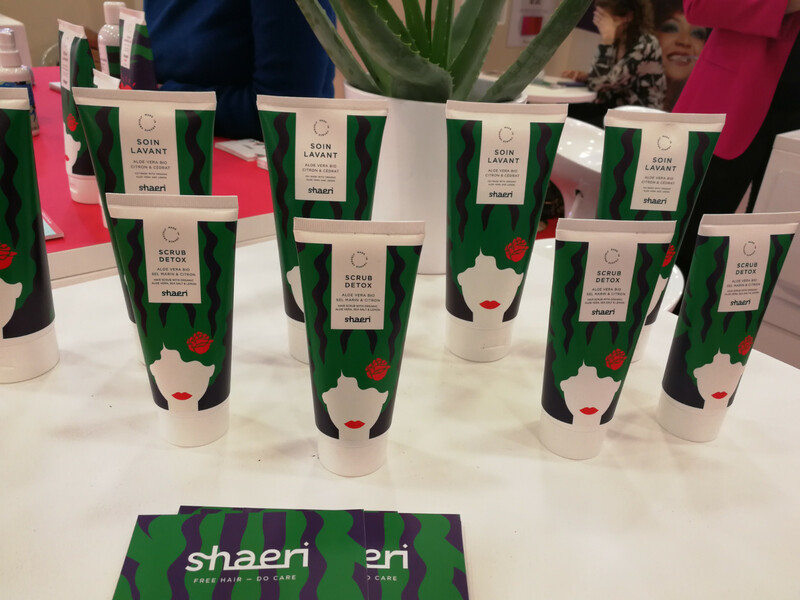 Shaeri already has a prette impressive distribution in France; the products are sold in the Birchbox store in Paris, in Galeries Lafayette department stores, in ethnic hair salons and online. 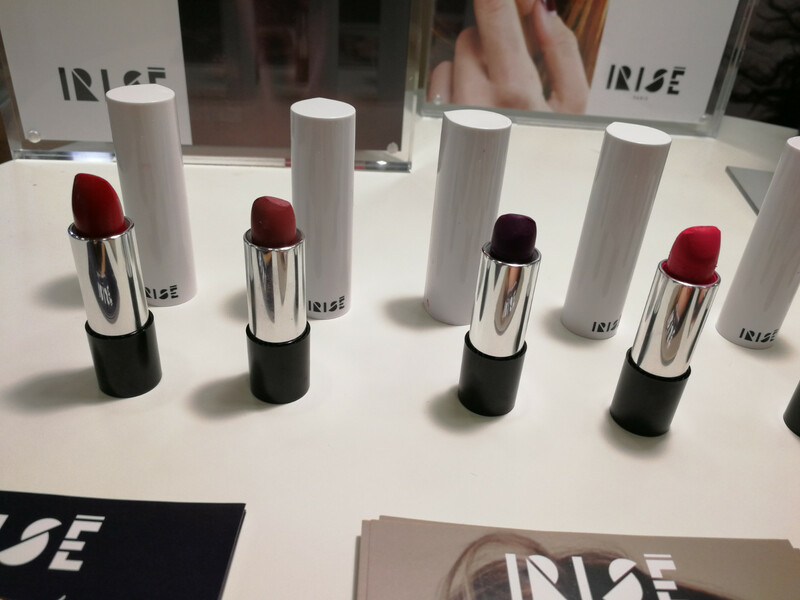 The booth of makeup brand Irisé was right next to Shaeri in the Emerging Prime section. Irisé is also from France and also a young company (the brand was launched in late 2017 online and entered offline retail in early 2018). 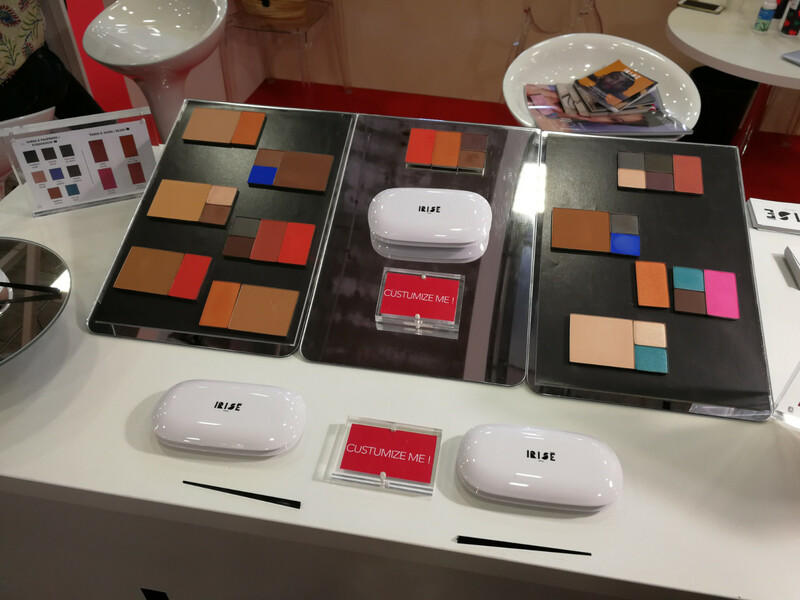 They offer a range of powder eyeshadows (seven shades), blushers (four shades) and foundations (eight shades) in bold, highly-pigmented colours that are suitable for a wide range of skin tones. There is also a lipstick range which offers six different shades – deep, richly pigmented shades with a creamy yet matte finish. 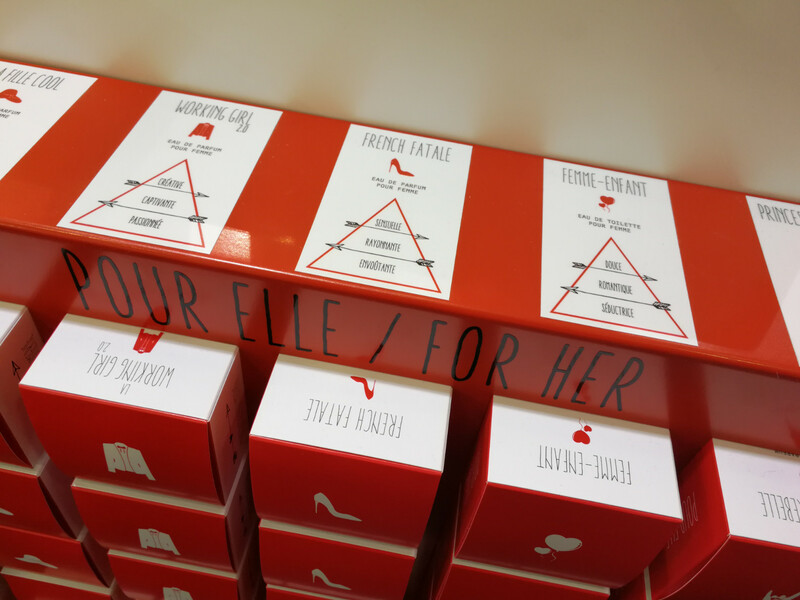 The brand’s slogan is Make Up Your Mood and the key piece of the collection is the so-called “Mood Box”. This empty palette (see pic above) can be filled with foundations, blushers and eyeshadows according to personal preference – the pans slot into the box quite easily. I love makeup brands that offer this kind of mix ‘n match approach! And Irisé’s range of colours is stunning. The brand is mostly sold online although the brand founder told me that her products will be available in Galeries Lafayette’s new Champs Elysées pop-up store in Paris soon. 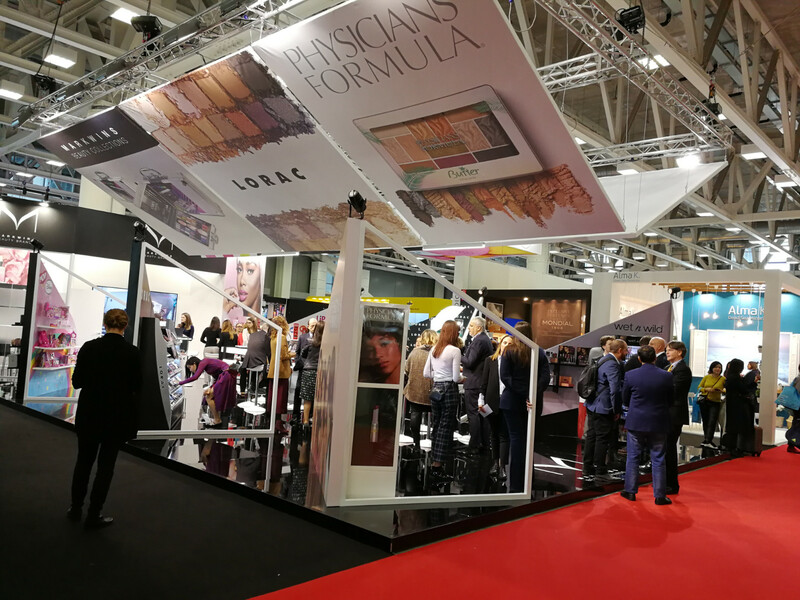 The company has also started to work with makeup artists to organise Irisé makeup parties – basically the direct selling approach. And now for something completely different! 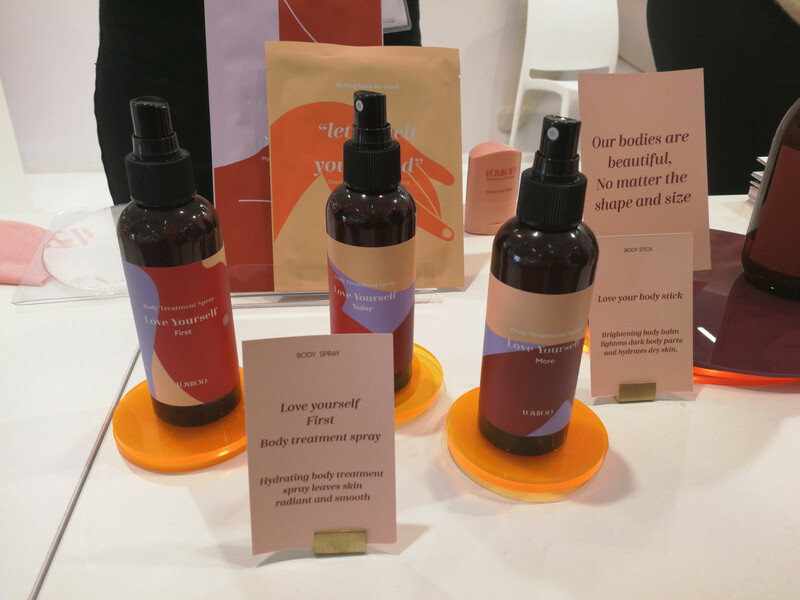 Lovbod is a Korean body care range, launched in late 2018 and it is one of the coolest disruptor brands that I have ever seen! The company was in one of the Korean pavillions, and I am so glad that I decided to walk through the Korea pavillion on my way to Cosmoprime that day. I was actually hurrying through the Korean tent (late for another meeting) when I saw Lovbod’s advertising imagery and came to a screeching halt. Check out their model! I can only repeat my Insta hashtags: #realwomen #realbodies #lovefreckles #redhairrules. Seriously, when did you last see a body care brand that did not use tanned, slim and toned body images to promote their products?! Yes, I know, the Dove Real Women campaigns are a step in the right direction (although they were never inclusive enough for my own taste) but I am fairly certain that the Lovbod lady wouldn’t have made it into the Dove line-up. 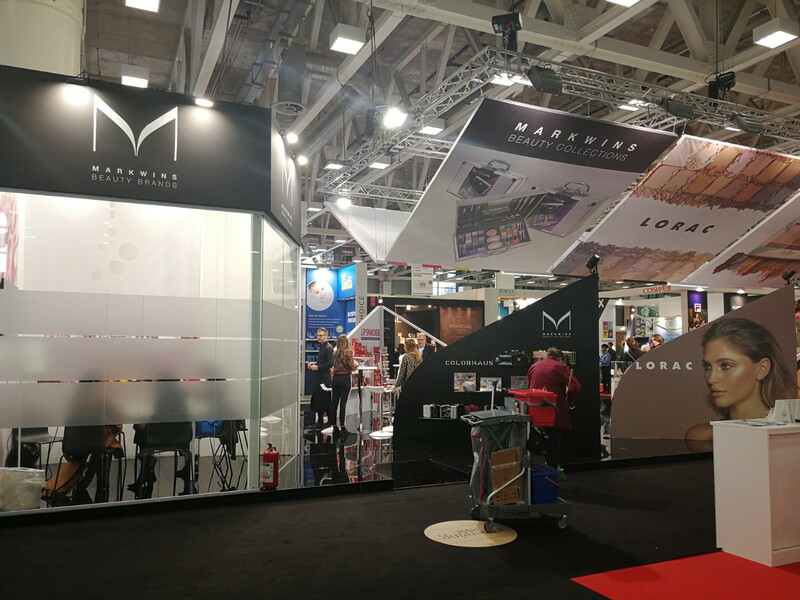 I double-checked with Lovbod’s international sales person at the booth and yes, the company uses the same imagery to market the brand in Korea. That is even more impressive – remember that South Korea is the cosmetic/plastic surgery capital of Asia and that the Korean society has a rather unhealthy obsession with physical perfection (you have to look like your Kpop/TV/media idols; v-shaped chin and all). 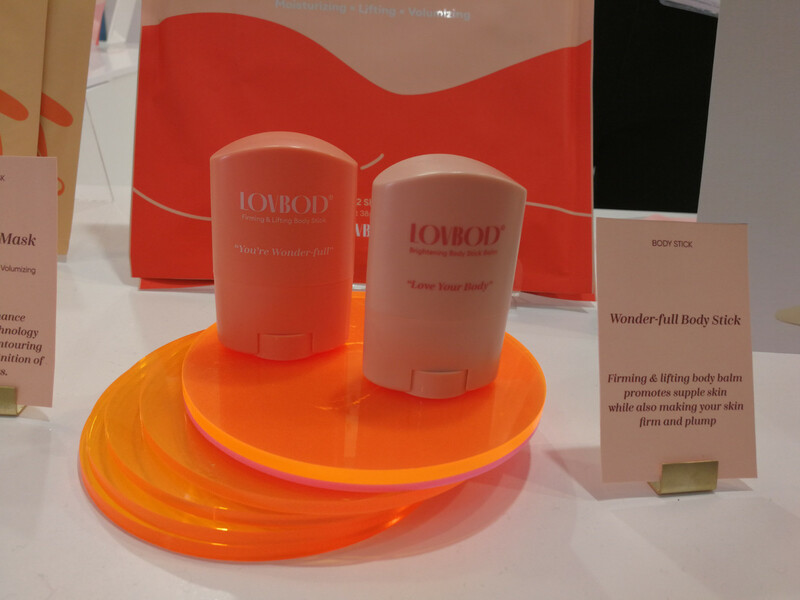 The Lovbod range offers 13 sku of imaginatively named body care, from a hydrogel bottom mask (the BumBum Mask, actually two hydrogel circles, one for each cheek!) over body balm stick moisturisers, body fragrances, body lotions and body essences, hand masks and neck masks. And the packaging design is such an eye-catcher! Lovbod’s founder Heidi Hyunjung Kim has a creative/design background and this definitely shows in her entire brand concept. In Korea the products are only available online at the moment but I was told that the company is in talks with various offline retail chains – I wonder if I’ll see the products in-store at an Olive Young or Lalavla when I’m in Seoul this May? Lovbod is also going through the CPNP EU registration process so, fingers crossed, the brand and its gorgeous redheaded model might soon make an appearance over here. I really want to see these products in Douglas and Sephora, prominently displayed right next to the traditional luxury body care ranges! I have a large fragrance wardrobe at home so I have a suitable olfactory outfit for pretty much any mood or state of mind. Mycollection of perfumes includes only a few true indie fragrances – the majority is niche-y mainstream and I am very happy with it. 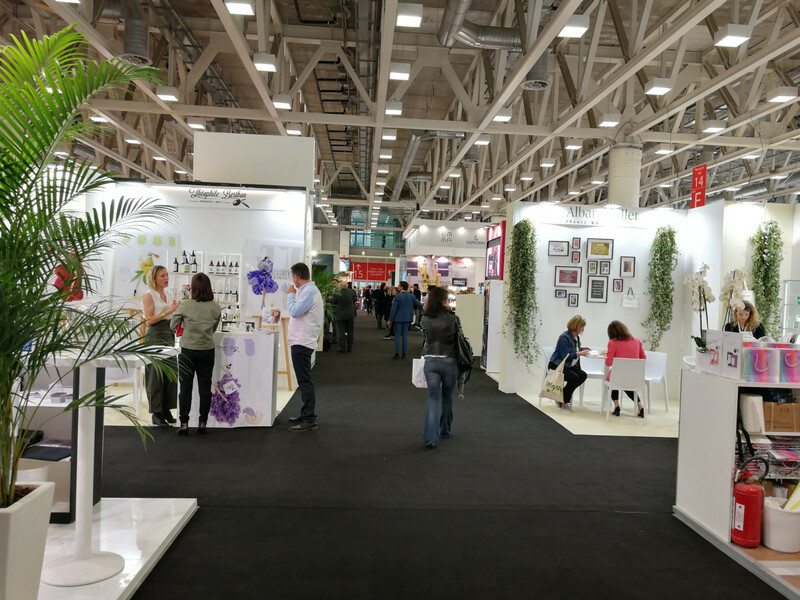 However, there’s no denying that artisan and indie fragrances are a key market driver and the exhibitors at Cosmoprime included some beautiful examples! 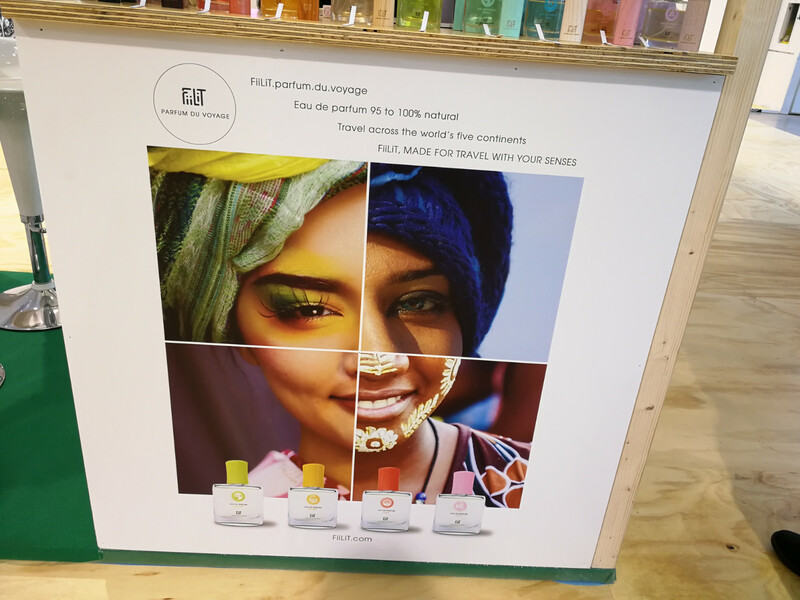 I had seen French natural fragrance brand Fiilit Parfum de Voyage at Vivaness trade show in Nuremberg last month but didn’t have the time to check out this artisan perfumery brand’s concept in more detail. 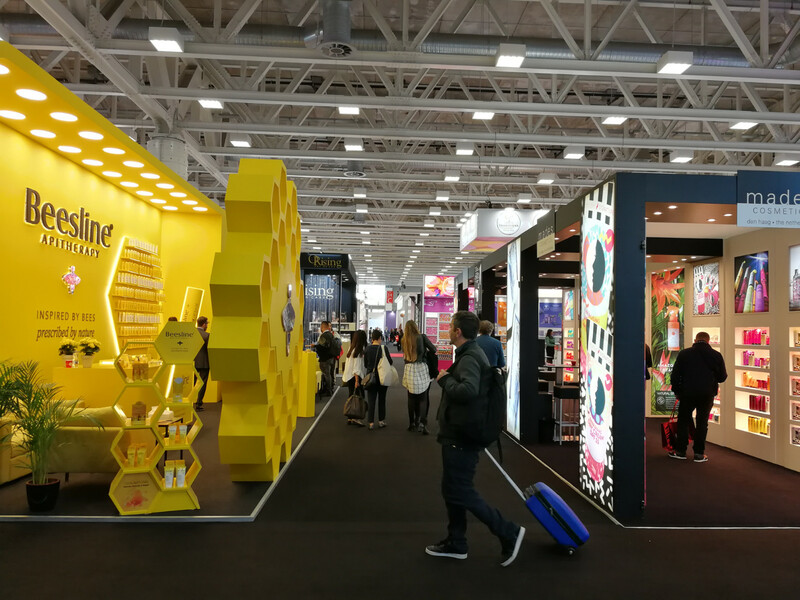 Luckily Fiilit was also an exhibitor at Cosmoprime (in the Extraordinary Gallery Green section) and I had the opportunity to chat with the brand’s co-founder Eloi Roberti. Fiilit was founded in 2016, and as the brand name indicates, its fragrances are olfactory travel diaries. Each of the ten fragrances currently in the portfolio is dedicated to a particular travel or holiday destination, like Tumbao (Cuba) which combines notes of blue ginger, pink berries, tobacco, cardamon and rum; Saudade (Amazonas), a blend of passion flower fruit, piri-piri, tonka bean, Guaicac wood and Balsam of Peru, or Kado (Japan) which is a fresh floral scent featuring yuzu fruit, green tea, cherry blossom, jasmine and mate plant. All scents are unisex and the entire fragrance brand has a distinct urban nomad vibe which I like. The products are also certified cruelty-free, vegan and carry the SlowCosmetique seal. Product formulas are natural, the sturdy packaging is made from ash wood sourced from PEFC certified forests in Spain and France; all fragrances are made in France (the base is organic French wheat-based alcohol) and most of the raw ingredients are from natural and/or Fair Trade origin. In fact, each fragrance contains a few regional components from its destination – the recently launched Tehani, for example, celebrates the destination of Polynesia with voluptuous white florals while Camino de Provence was introduced in January and combines lavender notes and rose. Each fragrance is available in three sizes: 100ml, 50ml and a travel-sized and refillable 11ml flacon. Fiilit is currently available in two international markets – Belgium and Germany – but the founders are hoping for a further geographic expansion. I’m keeping my fingers crossed; this is a very cool brand! Indie fragrance manufacturer Le Parfum Citoyen is also from France. The artisan fragrance house was launched in 2017 and the company is based in Nice. 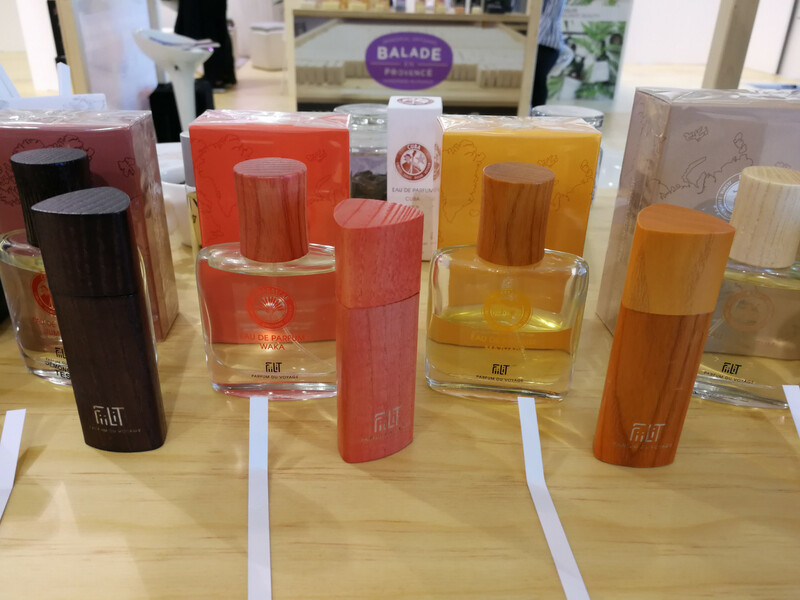 However, Le Parfum Citoyen’s fragrances are manufactured in Grasse and that’s also where the entire production chain is based: the company works exclusively with local packaging and ingredients suppliers. The brand offers ten fragrances, five for men and five for women. The perfumes carry ironic names like Le Hipster, Parisian Dandy, L’Homme D’Affaires, French Fatàle, La Fille Cool or Femme-Enfant, and the packaging design is fun and quirky. Instead of the usual fragrance pyramids to give olfactory “tasting notes”, Le Parfum Citoyen decided to use character traits and emotions to describe their fragrances – the female fragrance French Fatale, for example, is described as Envoûtante (bewitching) in the base with a heart of Rayonnante (radiance) and top notes of Sensuelle (sensual). And the Parisian Dandy (one of the men’s perfumes) offers a base of Joueur (player), a heart of Charmeur (charmer) and top notes of Branché (trendy/funky). 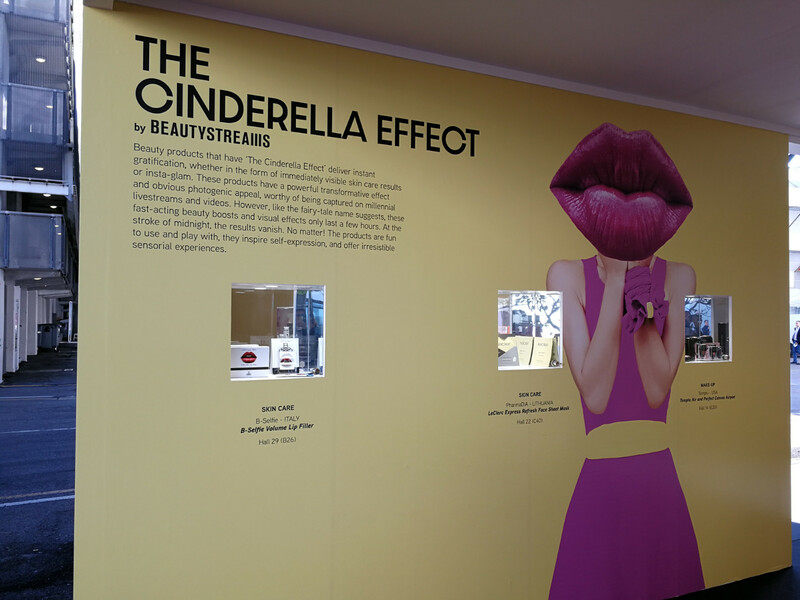 In France Le Parfum Citoyen is sold in selected perfumeries (including the Nocibé chain) and various concept stores but the fragrances are also available in a few international markets – Japan, for example, where Le Parfum Citoyen’s perfume range will soon be launched in the Tomorrowland retail chain. 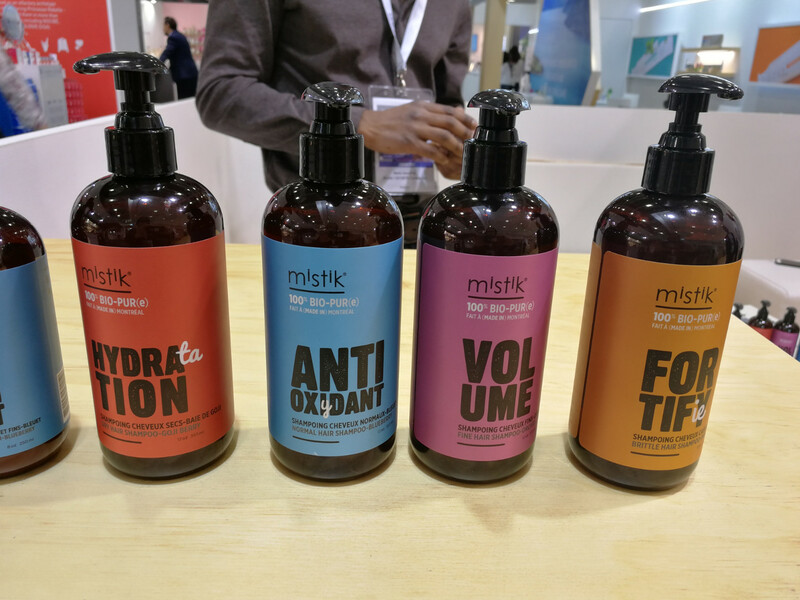 Mistik is a Montréal-based hair care brand which was founded in late 2016. All products are manufactured near Montréal and ingredients are sourced from organic Canadian farms whenever possible. The shampoos are formulated with Yucca saponins which the company says are much gentler on the hair than other plant-based cleansing ingredients. The brand’s product range includes four shampoos (Antioxidant with blueberry extract for normal hair, Volume with orchid extract for fine hair types; Hydration (goji berry) for dry hair and Fortify with maple extract for brittle hair), two conditioners (Antioxidant for fine & normal hair and Fortify for dry & brittle hair), a hair serum (Hydro Serum) and a hair oil (Oléo Touch). Product prices range from around 20-25 Euro. 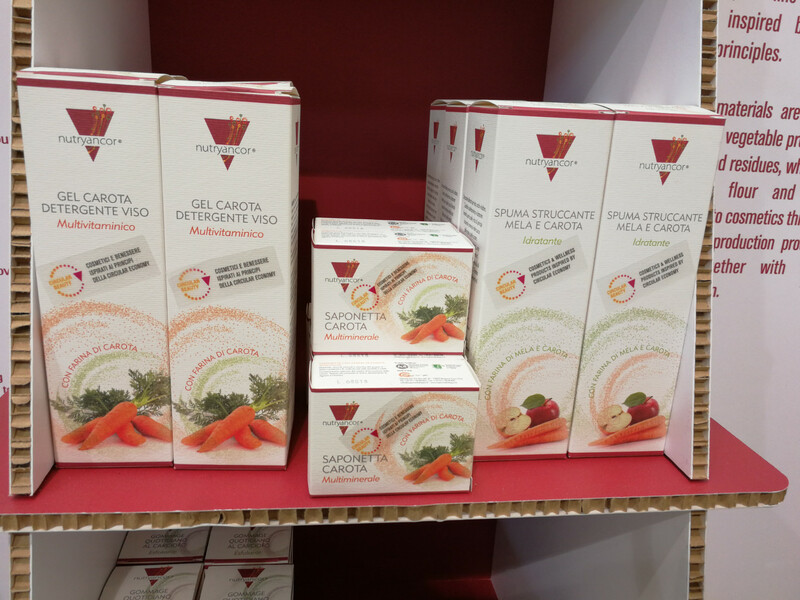 The product formulas are beautiful – organic, compact and high-quality – and check out the attractive, stylish packaging! 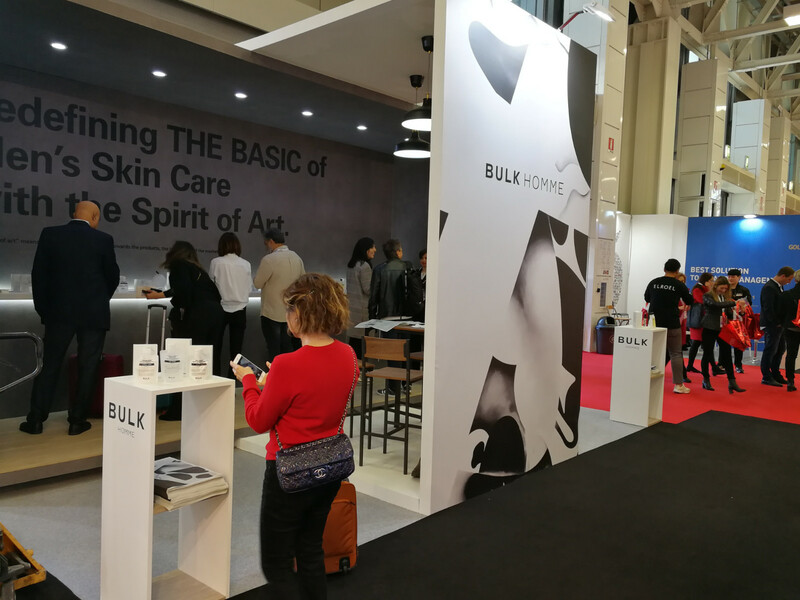 Walking past the booth on my first day I thought the brand was doing body or face care – I saw the words Hydro Serum and jumped to conclusions. 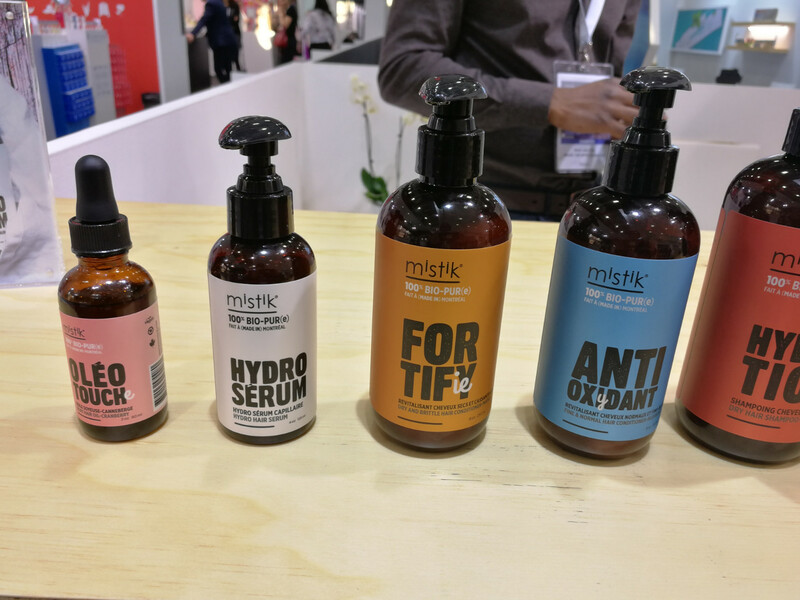 Anyway, Mistik has already found distributors for Norway and Sweden and now the company is planning to expand further in Western Europe. 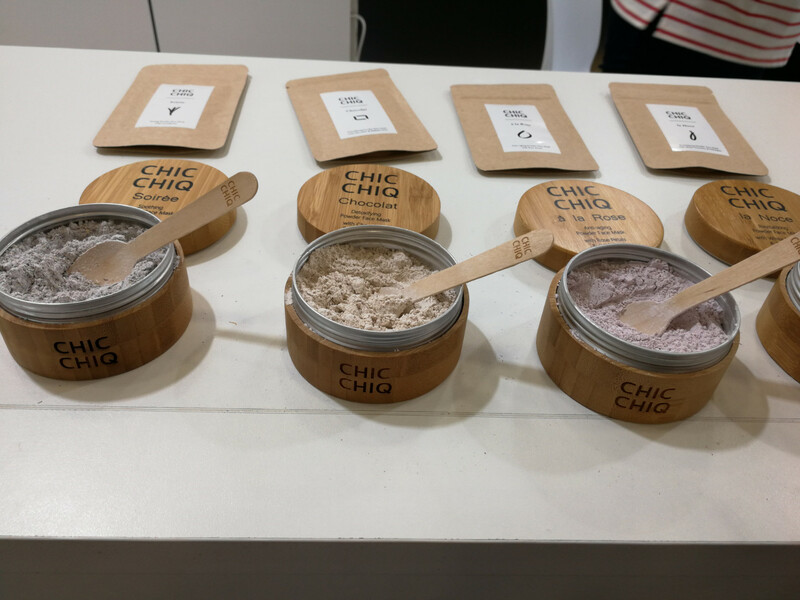 ChicChiq is an ayurveda-inspired skin care brand from Krakow in Poland. The company was launched in late 2017 and began selling its powder face masks online; then moved from social media/e-commerce into offline retail. 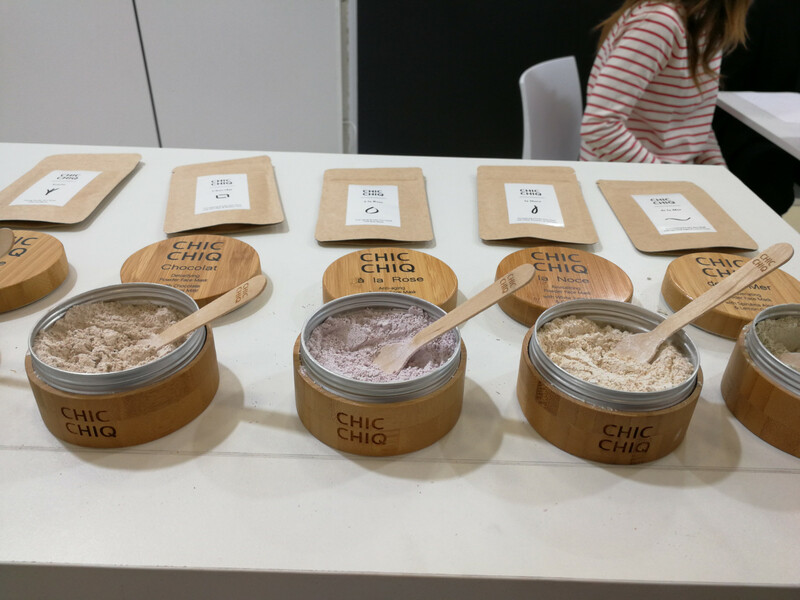 ChicChiq’s products are sold in selected independent beauty retailers and concept store and, increasingly, in yoga and wellness centres and spas. The product range offers five rinse-off powder face masks formulated with ayurvedic plant ingredients. 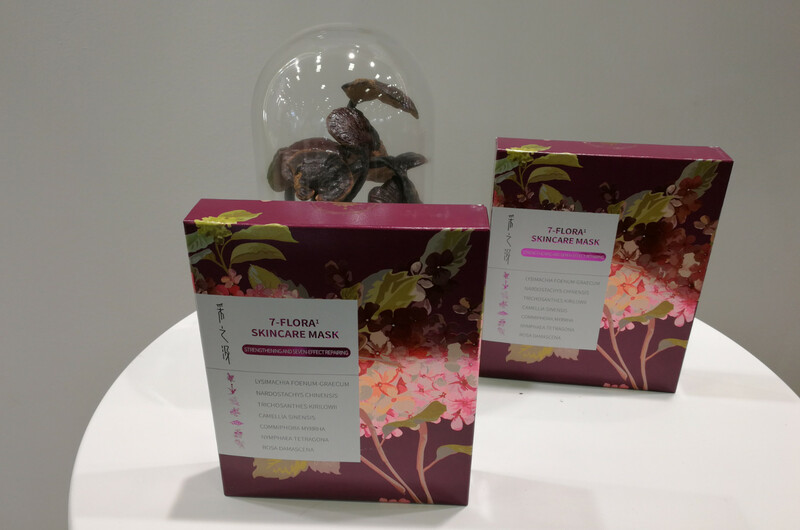 All masks are based on diatomaceous earth and alginate plus various powdered plant and herbal ingredients – the Chocolat Detoxifying Mask, for example, contains actual powdered cocoa mass and Fuller’s Earth while the the À la Rose Mask contains powdered rose petals and nettle blossom powder. The masks are available in bamboo jars and (refill) sachets priced at 25 Euro and 6 Euro respectively. 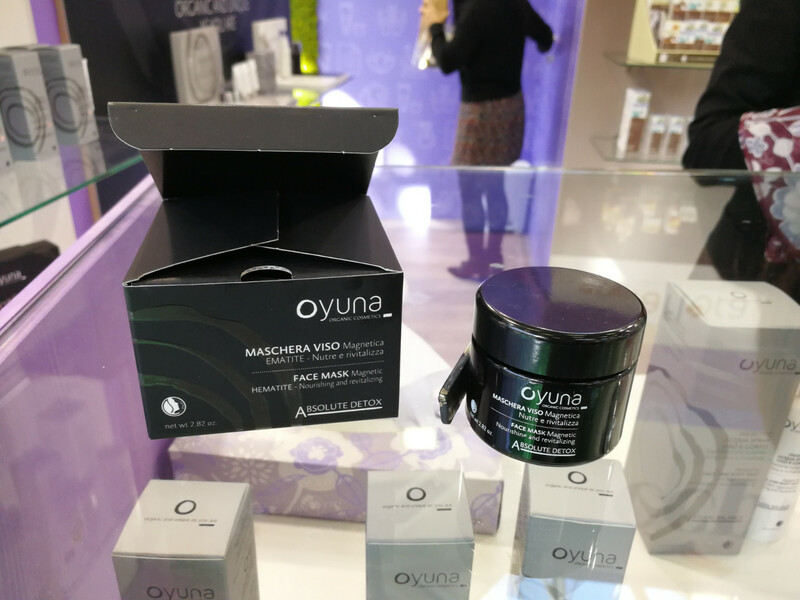 Italian organic face care brand Oyuna also attended Vivaness trade show this February but I didn’t have the time to visit their booth – however, I read so much about the brand’s Magnetic Mask on other beauty blogs that I was really keen to check this product out in more detail. 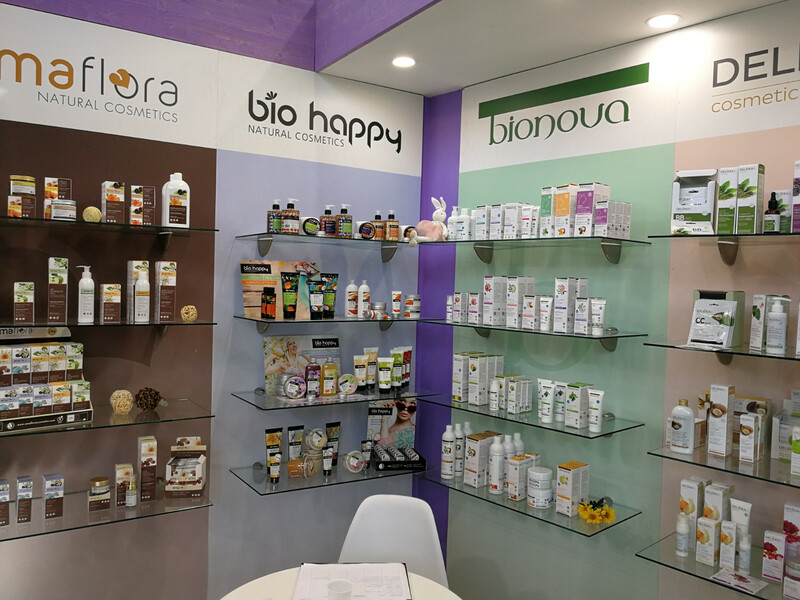 Luckily Oyuna and its parent company Gala Cosmetici (Gala’s other brands include Delidéa, Bionova, Bio Happy and Amaflora – they are all mass market beauty brands; Oyuna is the company’s premium line) were one of the Green Hall 21N exhibitors. The nice booth lady demonstrated how the Magnetic Mask (which was launched last year) works. The formula is based on various moisturising plant oils (including argan oil and sunflower oil) plus other liquid actives. Kaolin clay and hematite particles are blended into this oil base so the mask texture is glossy and tends to separate – you have to stir the mask mixture thoroughly before applying it to the skin. It really is fascinating to watch. What is left on the skin is some oily residue which you then massage into the skin. 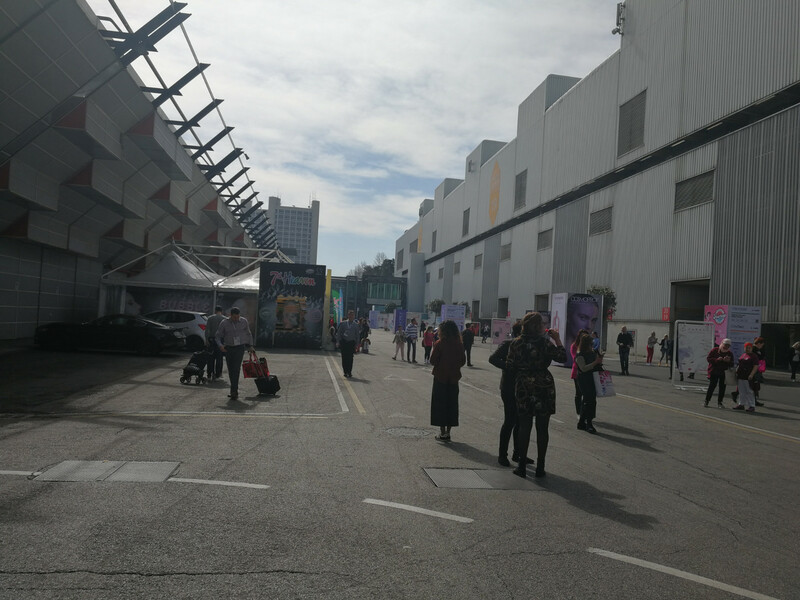 I was really surprised to see that Hall 21 boasted a Korean pavillion this year. 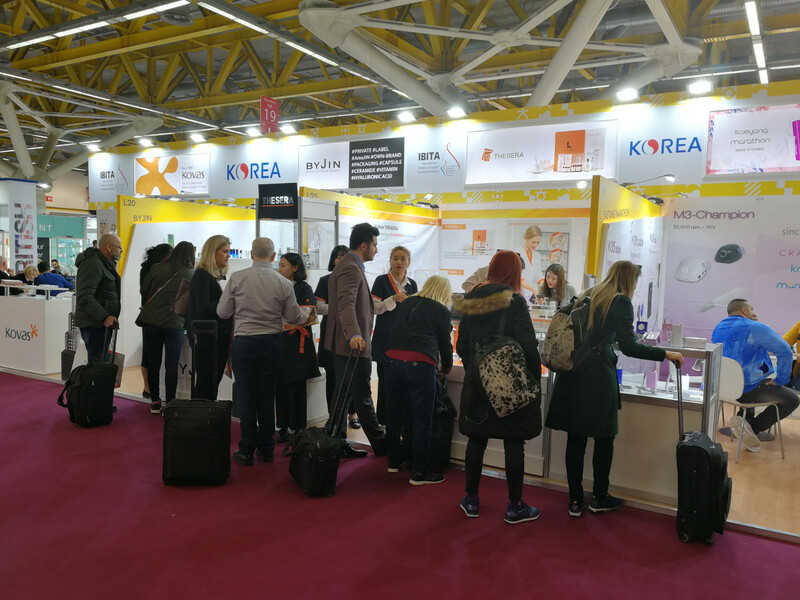 There are quite a few Korean pavillions dotted around Cosmoprof Bologna, in Cosmopack of course (Cosmopack is the packaging part of Cosmoprof Bologna trade show) but also in the salon beauty section and in finished cosmetics, i.e. Cosmoprof; I think there were at least two stand-alone Korean pavillion tents and smaller groups of exhibitors in the various Cosmoprof halls. 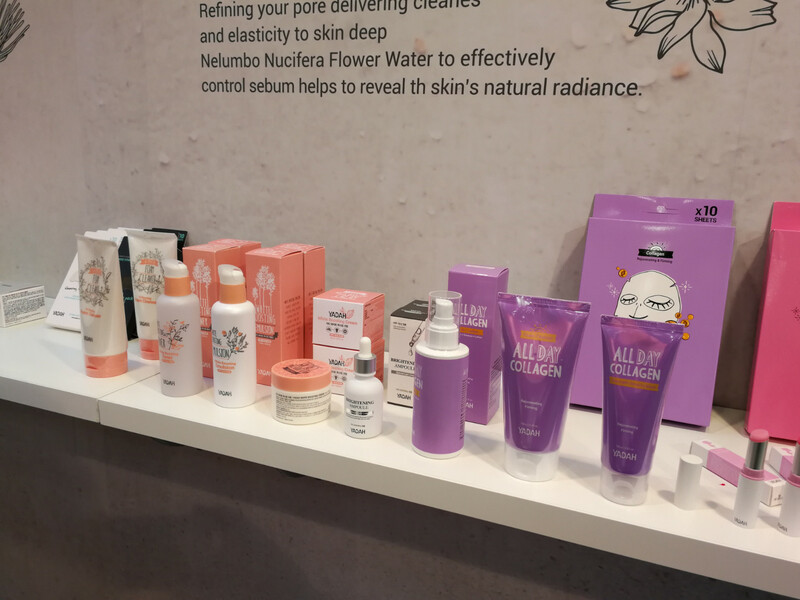 However, I had never come across a Korean pavillion in Hall 21 (which is where most of the natural and organic brands are located) so I went to check it out. 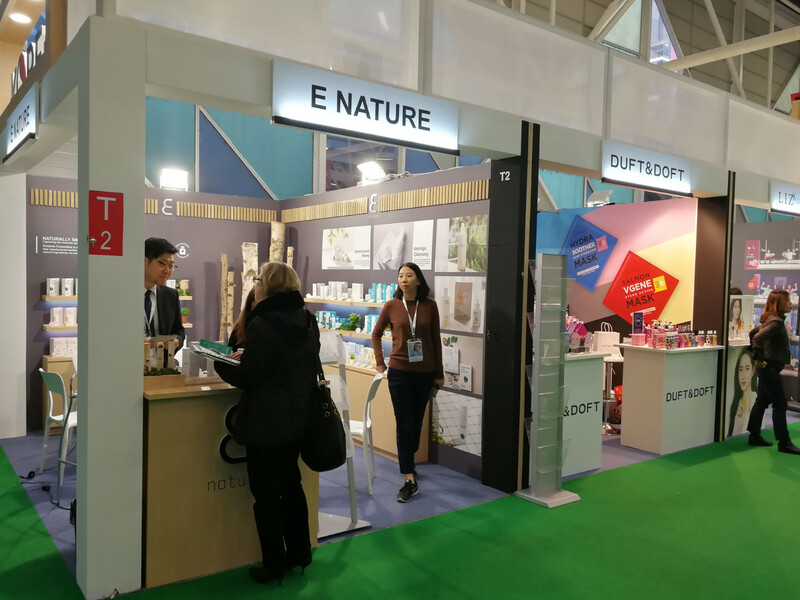 I first met Korean naturals brand E Nature at last year’s China Beauty Expo show in Shanghai (here’s my blog article: China Beauty Expo 2018) so I already knew that the brand was launched in 2017 and that it belongs to the line-up of Korean manufacturer Hanbul (makers of the famous It’s Skin brand). 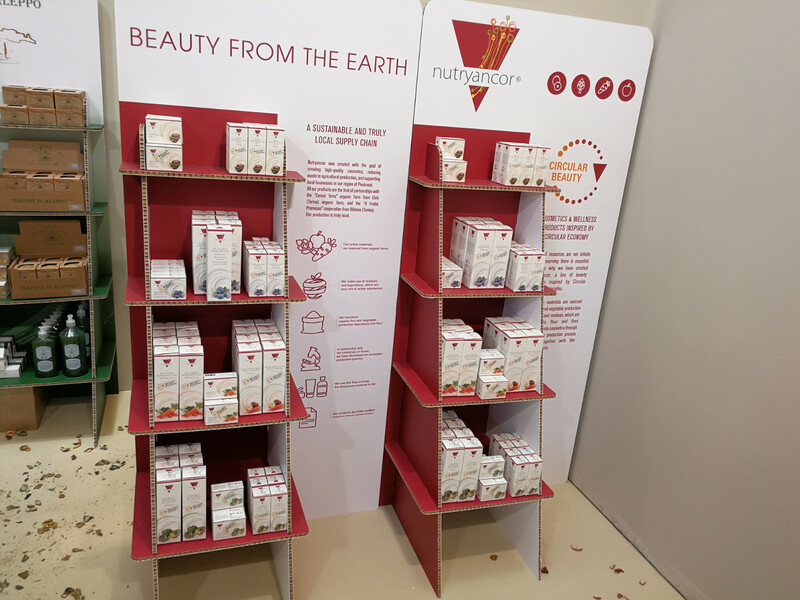 I also noticed that the brand’s products have been trending quite a bit on Insta – especially in the US – and now it looks like E Nature is starting to explore the European markets. 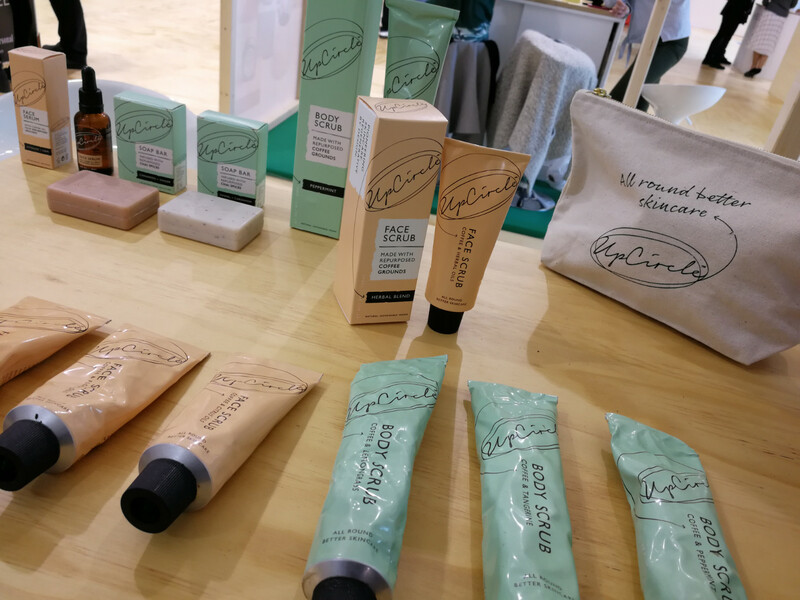 At the trade show the brand presented three of its new launches: the hydrating Rice Essential Tone-Starter (meaning it’s a bit of a first essence, i.e. 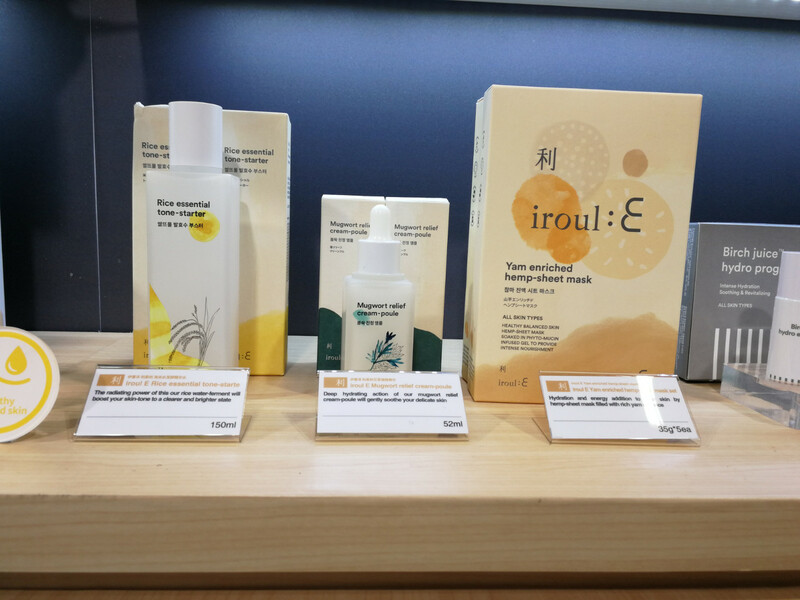 the first hydrating toner you apply after cleansing your face), the Mugwort Relief Cream Ampoule (the texture of this ampoule really is creamy and whitish in colour rather than the more usual clear ampoule texture) and the Iroul:E Yam Enriched Hemp Sheet Mask. 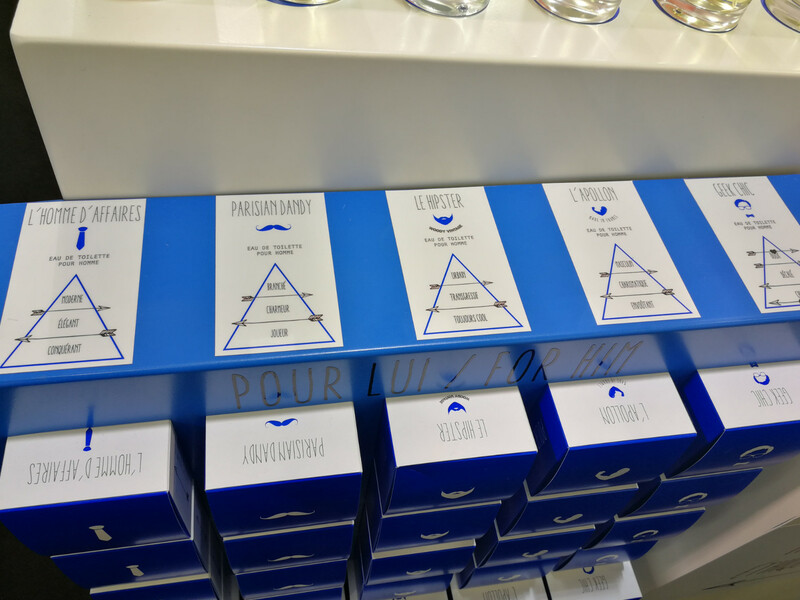 Another Korean pavillion exhibitor in Hall 21 was Yadah Cosmetics, a nice little brand that I see at Cosmobeauty Seoul every year. In the picture you can see the brand’s new 3-sku Cactus range which was launched in early 2019. The products are based on cactus stem extract which is a very popular ingredient in Korea, I was told (it’s highly moisturising and soothing and is used much like aloe vera here in Western Europe) and the range offers a toner, ready-to-use toner pads and soothing gel. And the packaging is really pretty. 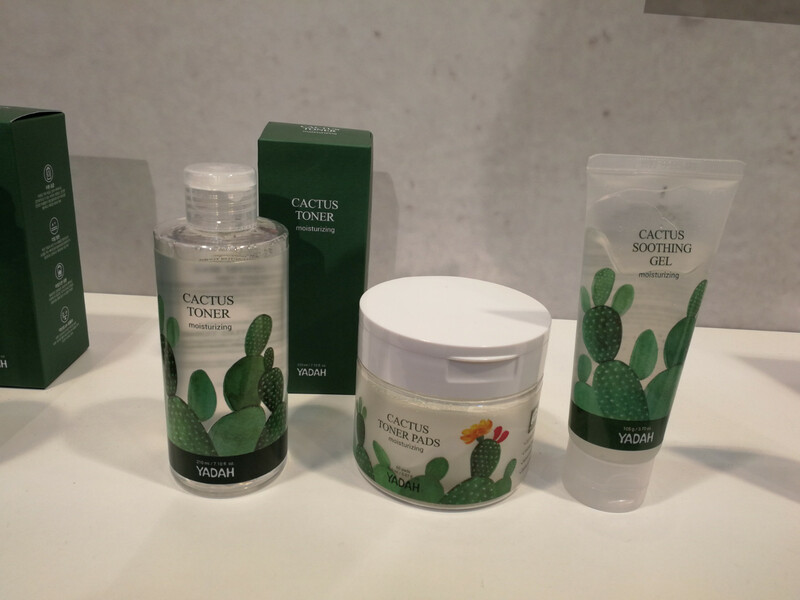 There’s also be a few new Cactus products soon, including an all-in-one lotion, an essence toner, a gel cleanser and a cream. 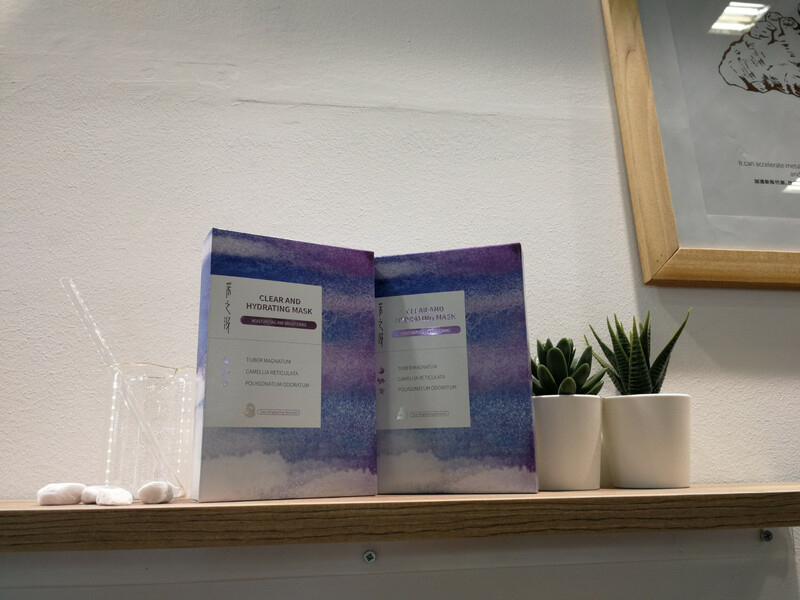 I was very pleased to see Chinese TCM sheet mask brand Yunnan Baiyao at Cosmoprof Bologna – I had met the brand this January at Cosme Tokyo (check out my Cosme Tokyo 2019 trade show for a detailed description of the company and what they do) and was given several sheet mask variants to try. However, the packaging of the Cosme Tokyo masks had been in Japanese – Yunnan Baiyao entered the Japanese market last summer – so Google Translate was, as usual, struggling with the translations of the TCM plant complexes. 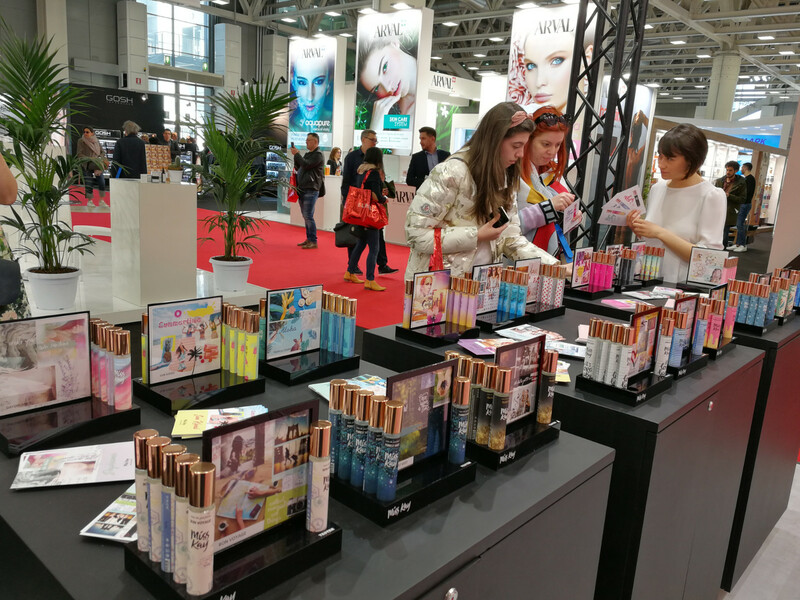 At Cosmoprof, Yunnan Baiyao had their new European/English language packaging (the brand has already completed the EU cosmetics registration process) and finally I could read the ingredients in person (so to speak!). 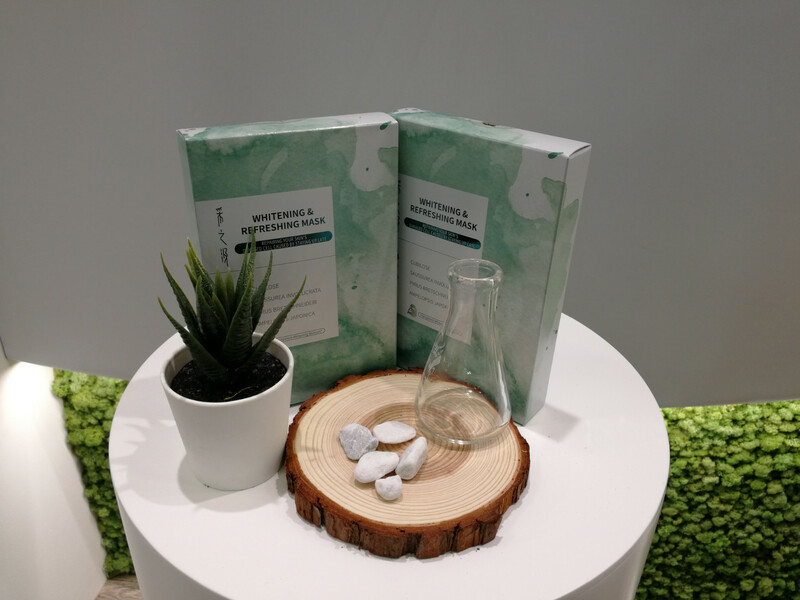 The product formulas of Yunnan Baiyao’s Orienature sheet masks are very simple – they’re based on water and then follows one plant extract after the other. And that’s it! Check my Insta feed for pics of the Yunnan Baiyao INCIs. 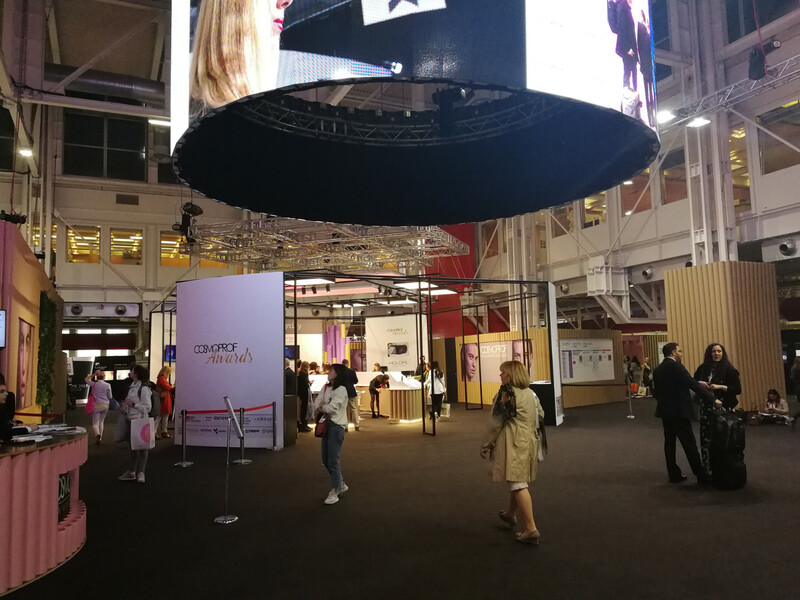 Anyway, Yunnan Baiyao is now ready to enter the European market – hence their lavish Cosmoprime exhibition booth – and I really hope that they’ll find a distributor here. The entire range is already USDA certified and next month the products will also receive an Ecocert certification. So, fingers crossed! 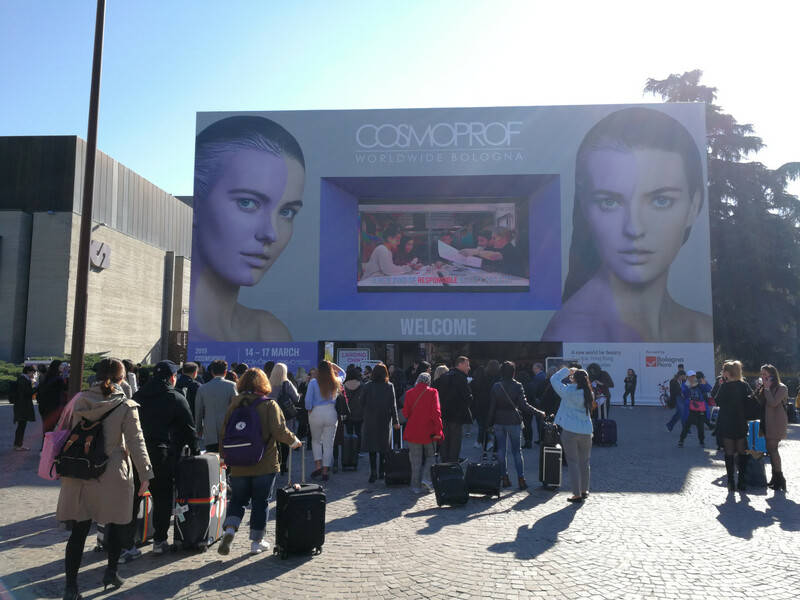 And that was this year’s Cosmoprof Bologna! I hope you enjoyed the article. Here are some more pictures of the show.